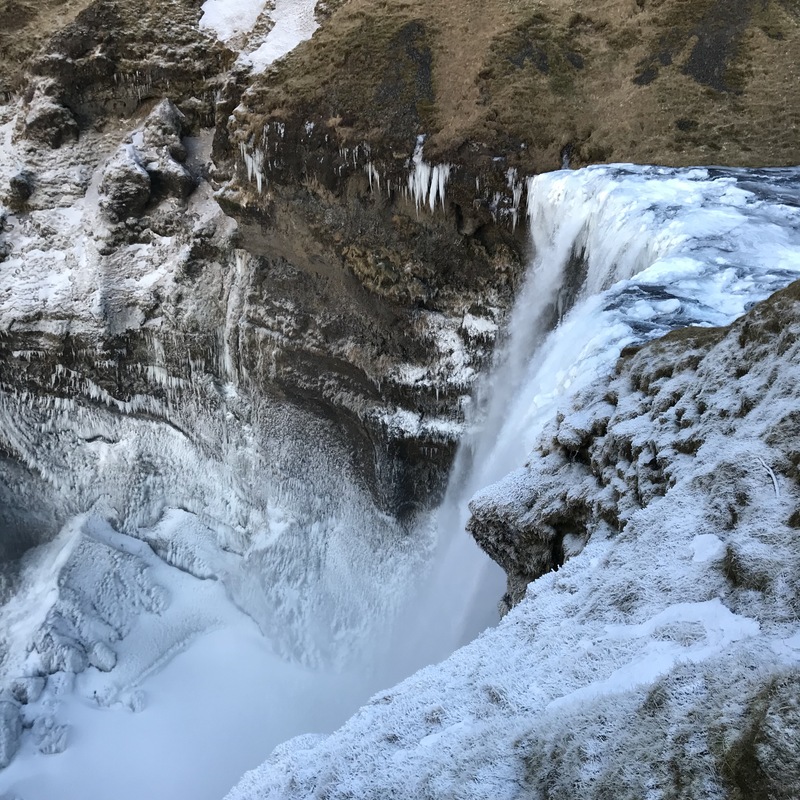 Iceland is an incredible feat of nature and nothing prepares you for the beauty. 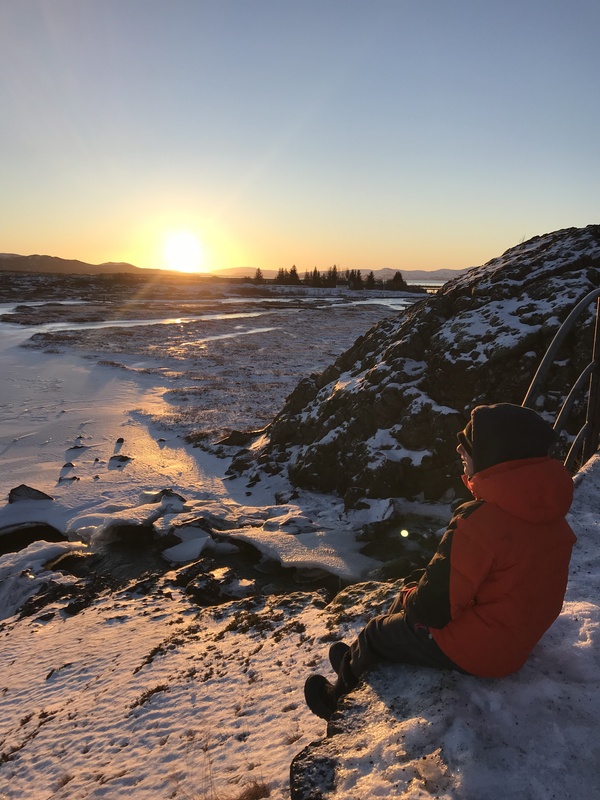 Traveling to Iceland with kids will be a simply amazing experience for the entire family. 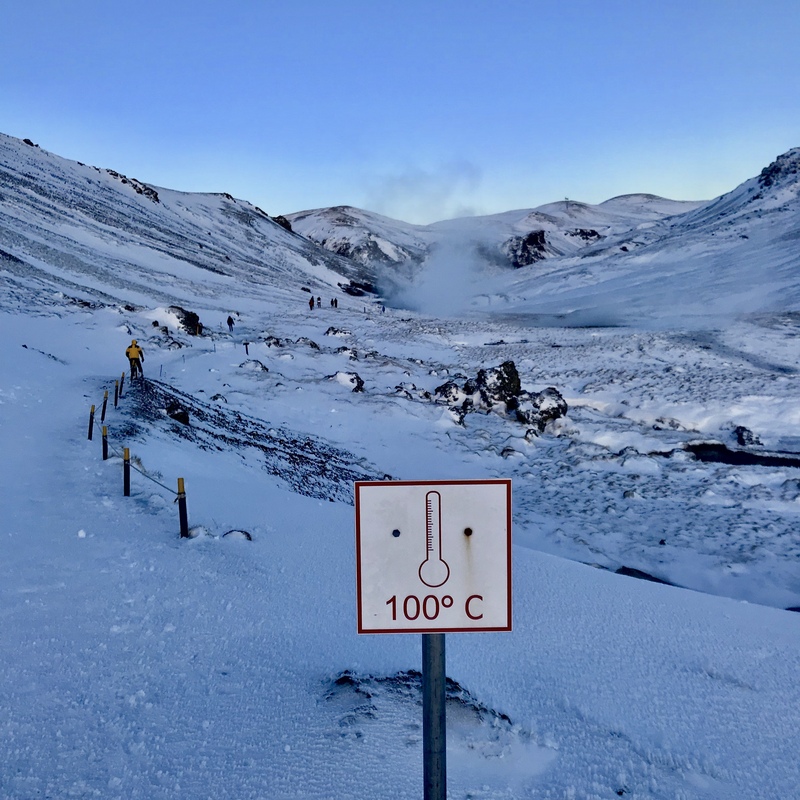 This country, with a population of approximately 335,000 people, generates its own electricity, heat, and water, by geothermal energy. 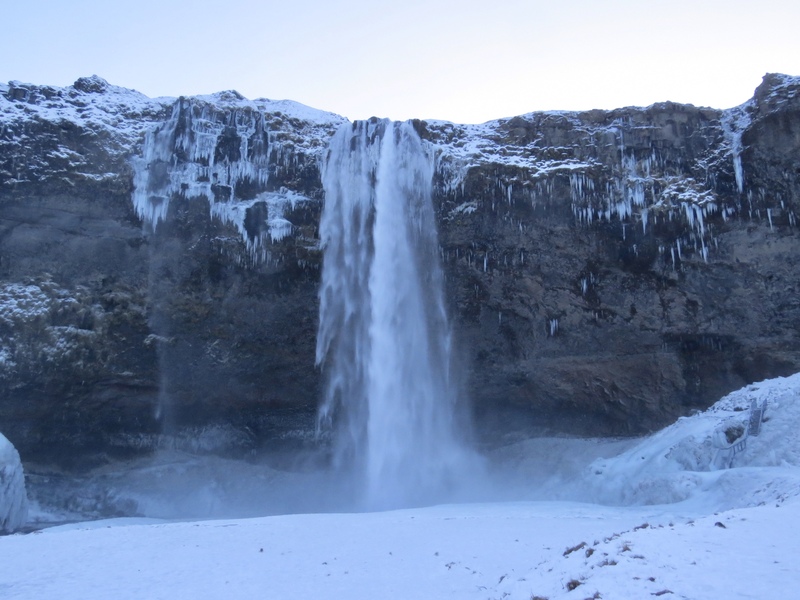 About 85% of homes in Iceland are heated with geothermal energy. 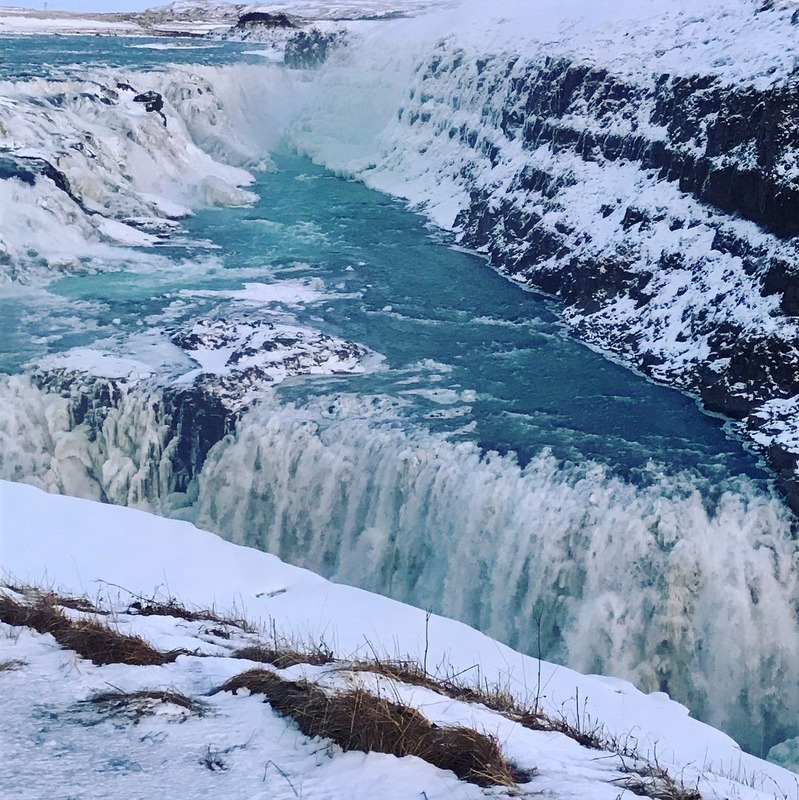 We recently visited Iceland and spent a few days in Reykjavik (Reykjavik warrants its own blog post here:), took a tour to visit the stunning Golden Circle, and drove along the southern coast. 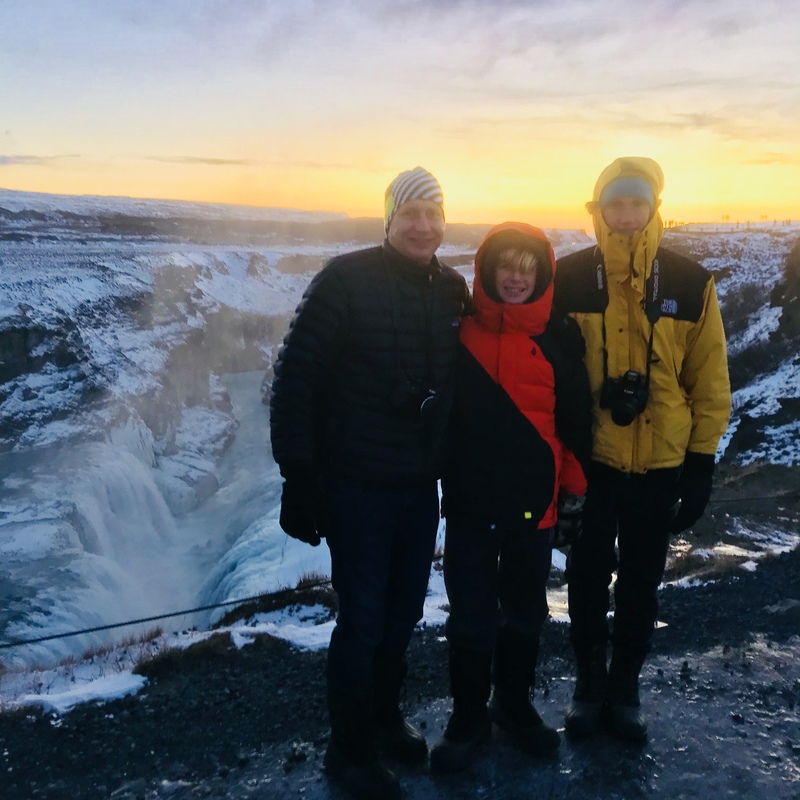 Given the unpredictable terrain and natural elements in play, we opted for a small group 5 day tour to visit the Golden Circle. 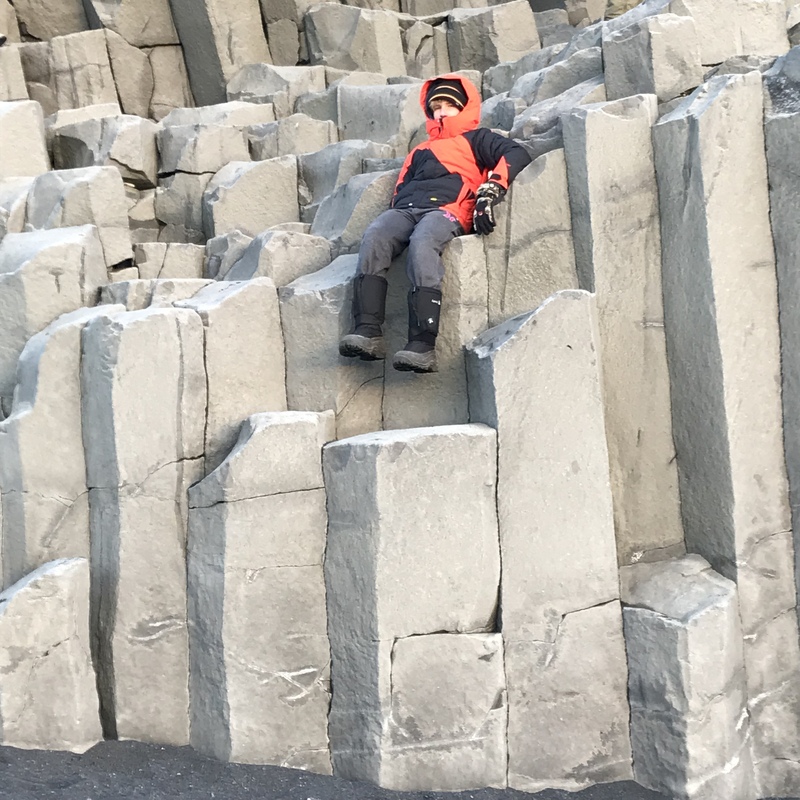 We left Reykjavik early on the first day at 8am. 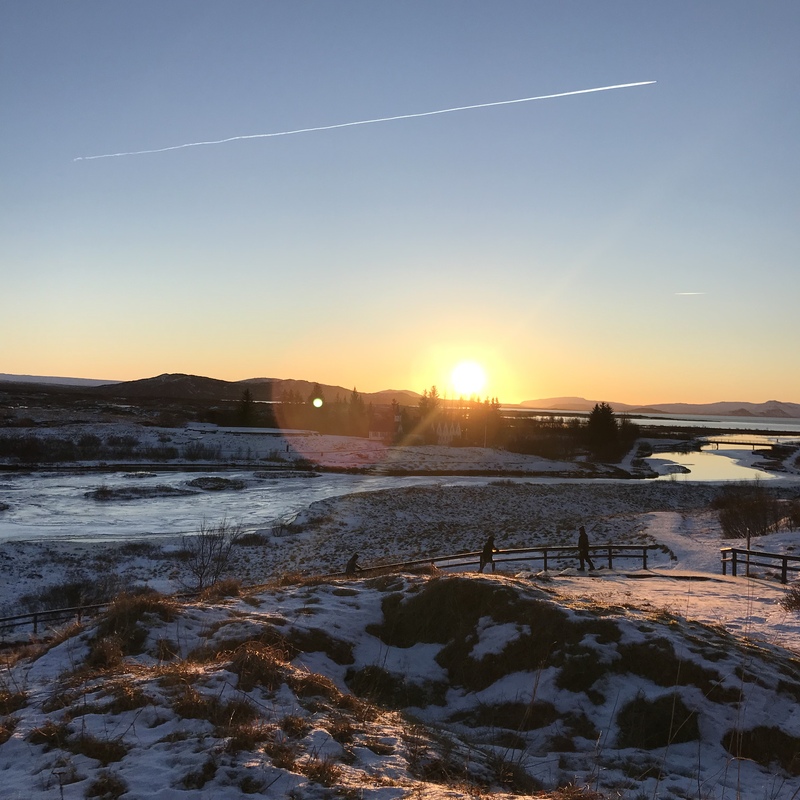 It was still total darkness since there are only 4 – 6 hours of sunlight during December in Iceland. 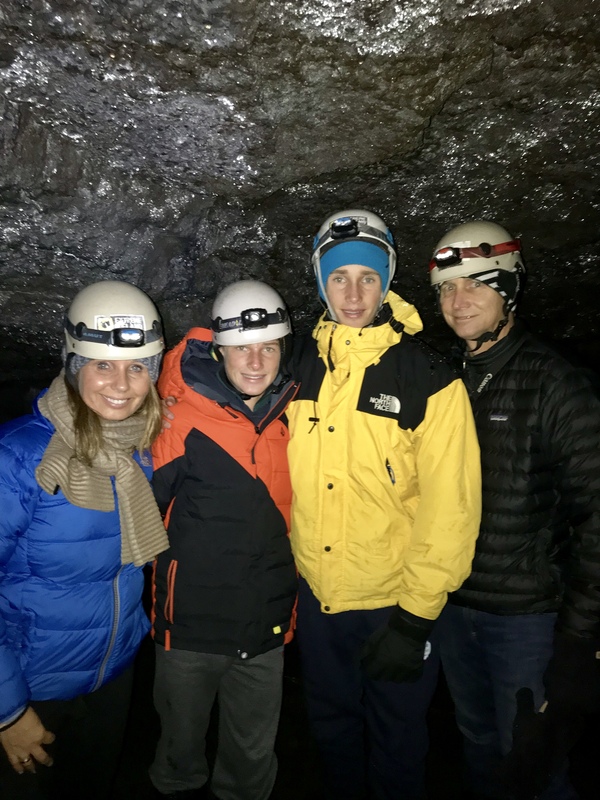 Our first stop was a lava cave hidden in the Blafjoll Mountains. 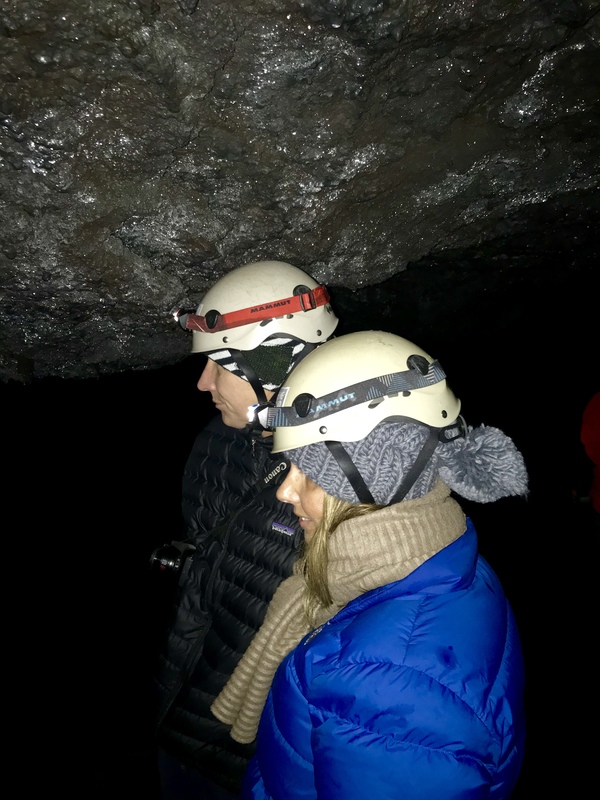 Safety first when you’re in a lava cave! 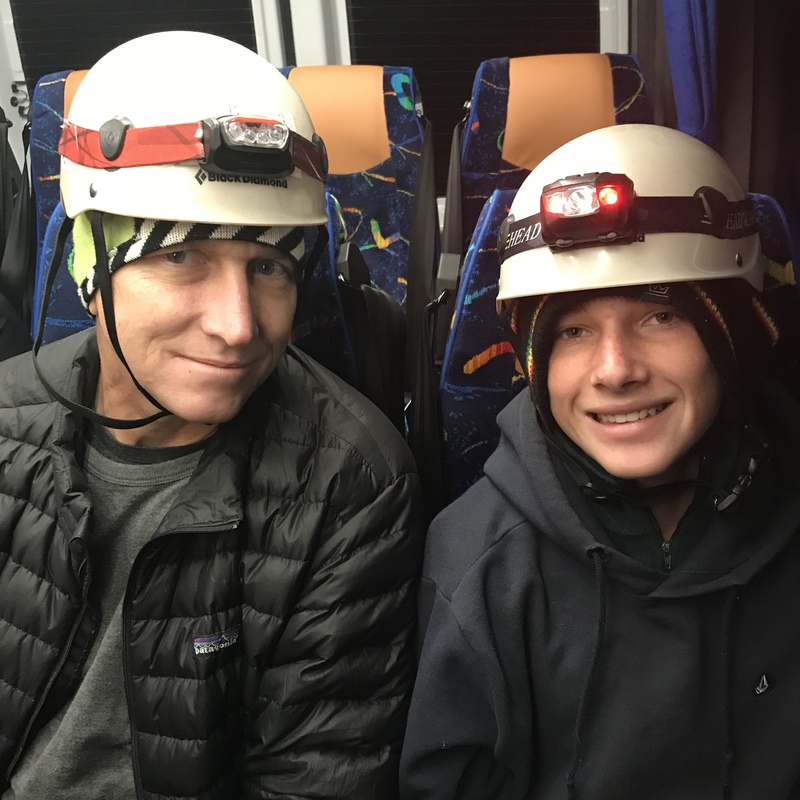 We grabbed our helmets, put on crampons since it was extremely icy, and headed towards the cave opening. Bearing in mind it’s still completely dark at this point, so the whole experience was a little unsettling. 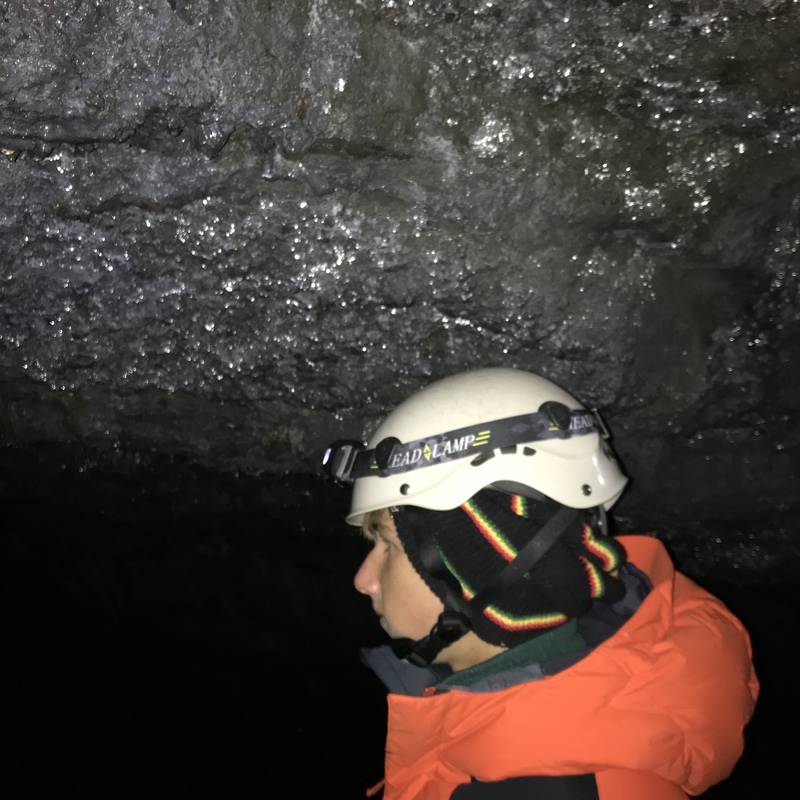 We followed our guide closely and ventured deeper into the cave. This is not for the claustrophobic or the agoraphobic. 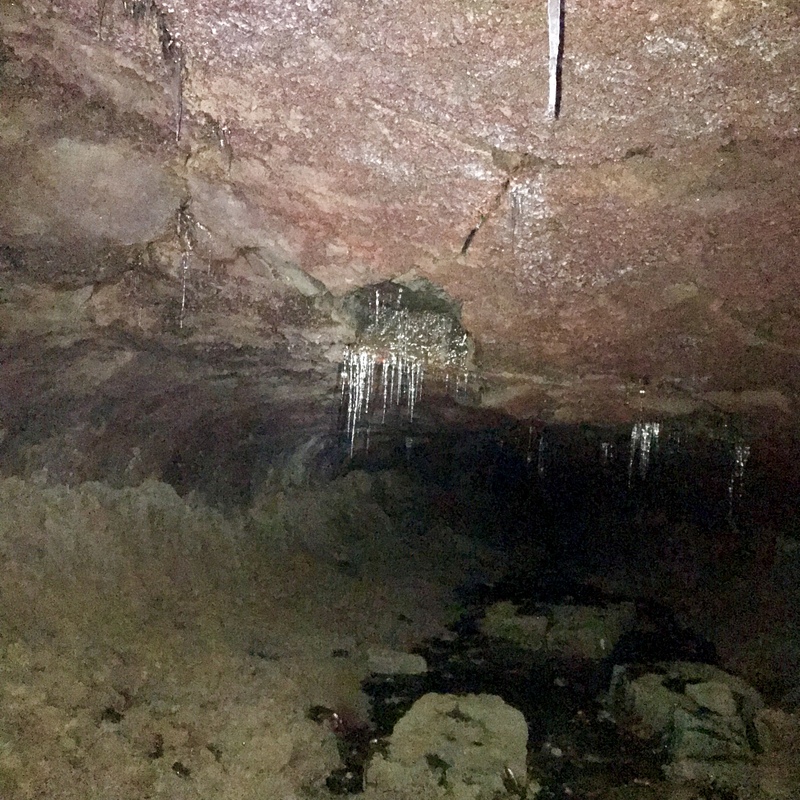 I’m not completely comfortable in small spaces, and definitely needed to put any thoughts of fleeing the cave out of my mind, since it wasn’t a possibility. 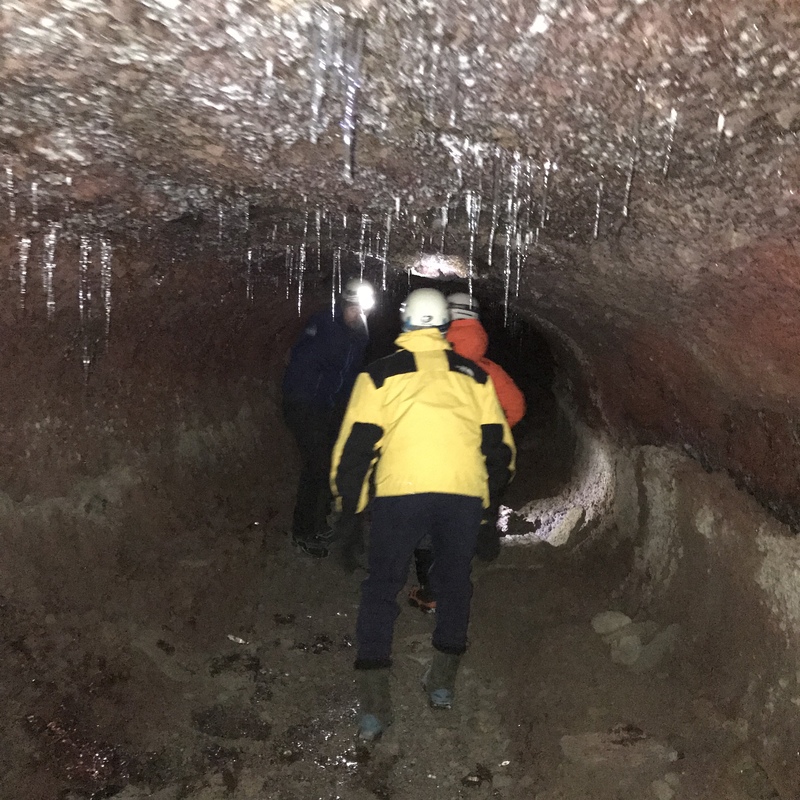 It was completely dark, damp, icy, and my children were 10 feet ahead of me. I’m pretty sure child protective services would not want me to flee and leave them trapped underground. 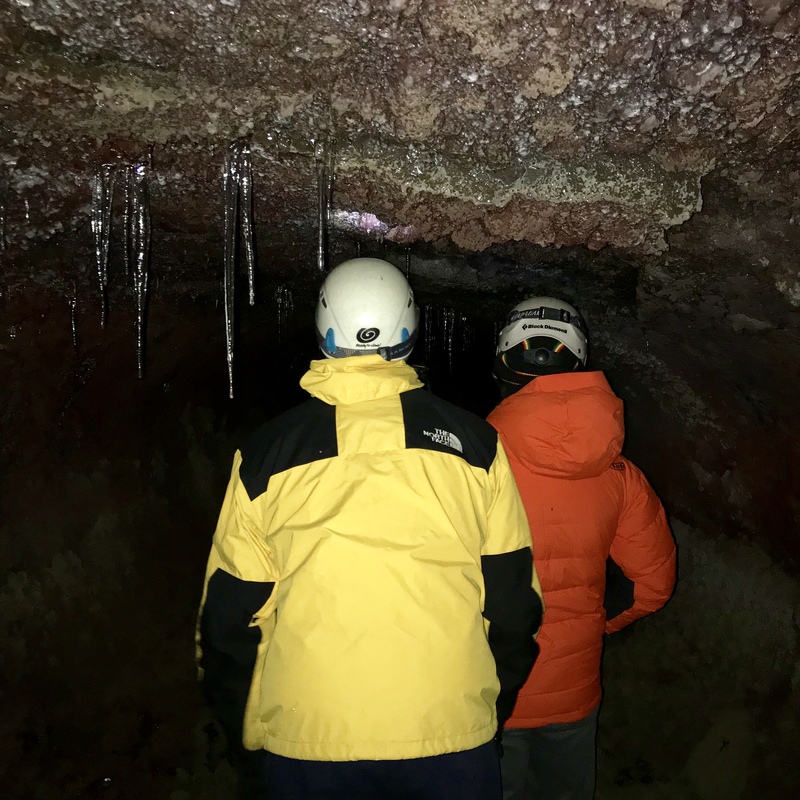 After a while I became more comfortable as we squeezed past rocks, crawled through the cave that was formed by flowing volcanic lava, and checked out the stalagmites and stalactites. The journey back to the opening was less uncomfortable. 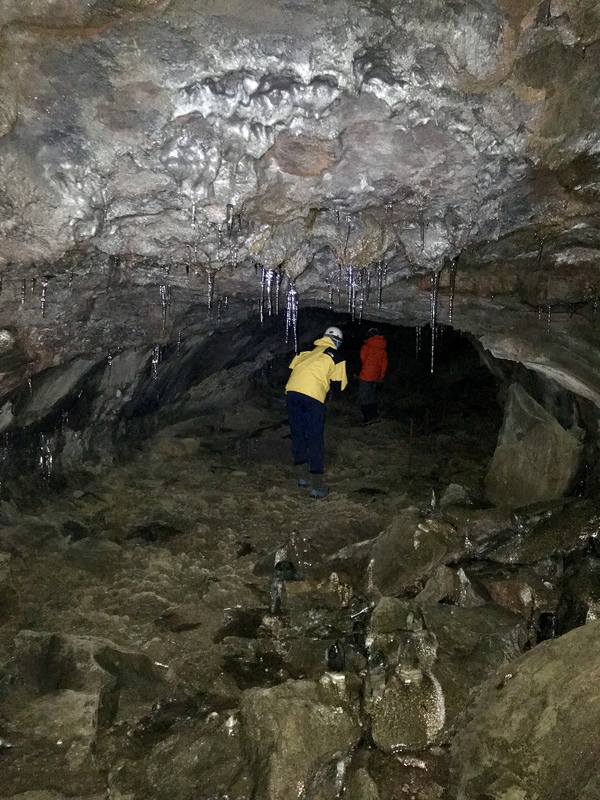 We knew what to expect and as we approached the cave opening, we could see the morning sunrise. 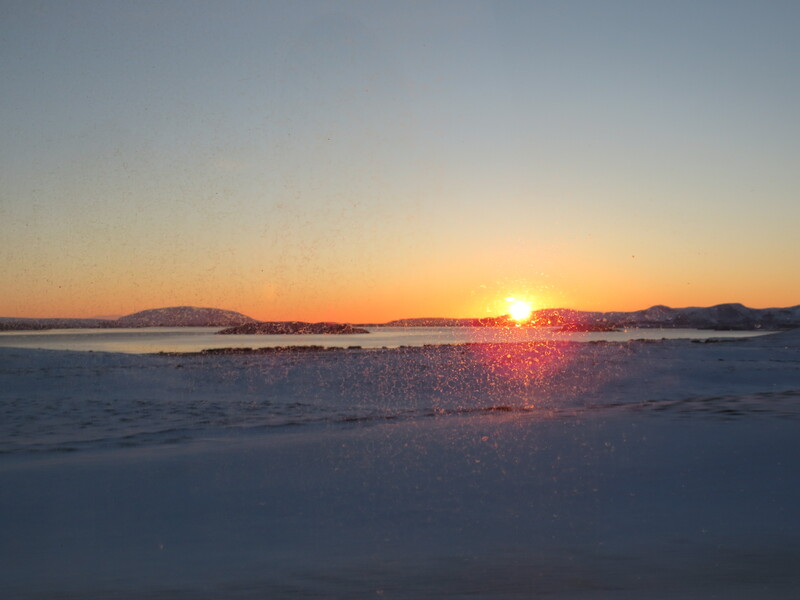 Daylight was finally close, and it was only 10.45am! Happy to breath fresh air again! 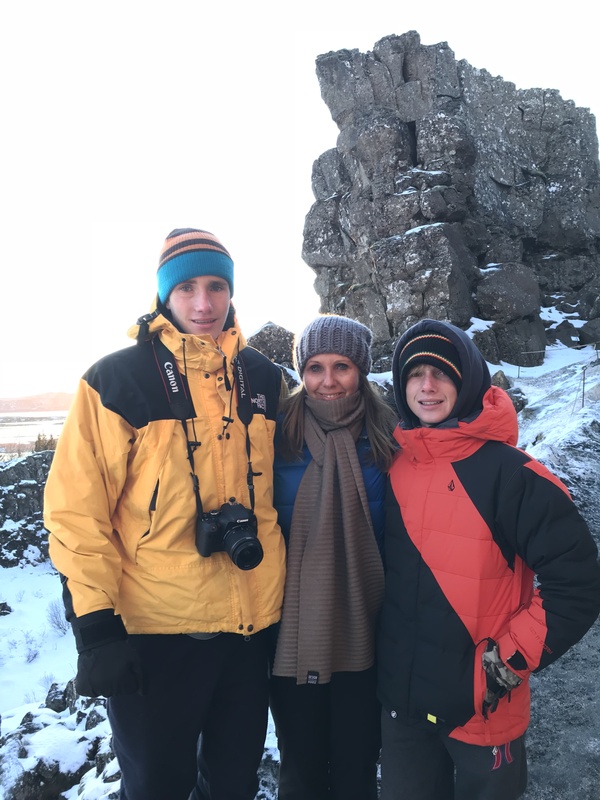 Our next stop was Pingvellir National Park. 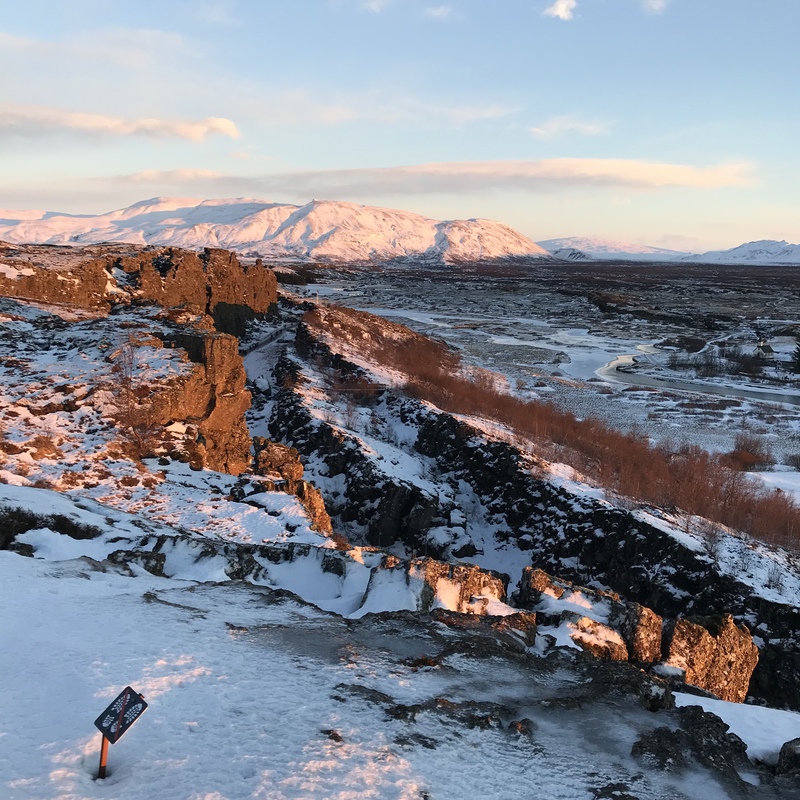 This is a UNESCO world heritage site and we were able to see the faults created by the North American and Eurasian tectonic plates shifting apart. 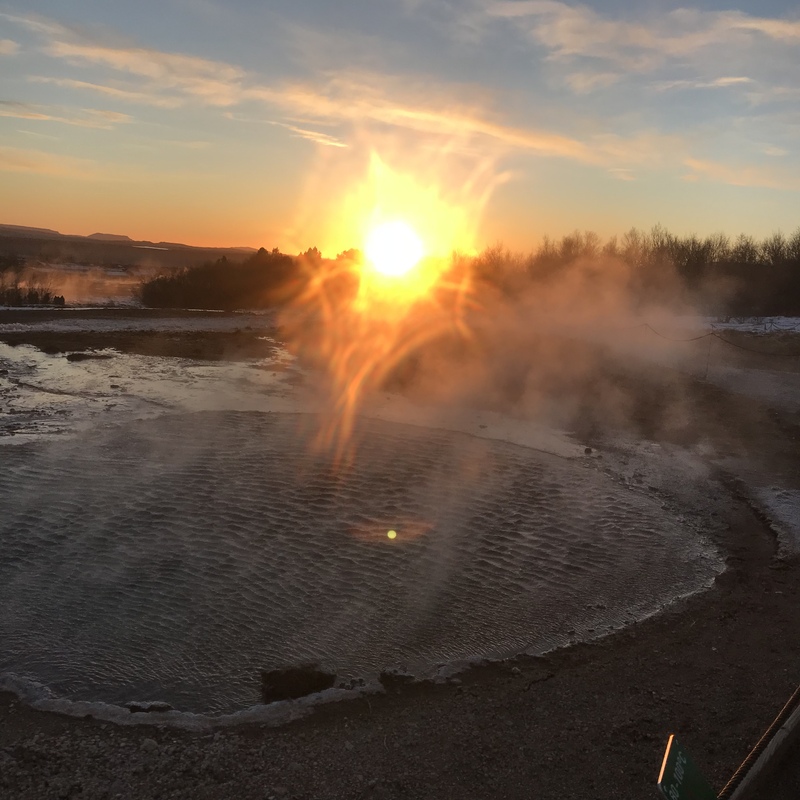 Next we drove to the Geysir Hot Springs and saw lots of geothermal pools. Strokkur is the most active pool and shoots a huge stream of boiling water straight up into the air approximately every 10 minutes. This was a stunning sight and equally incredible each time it erupted. 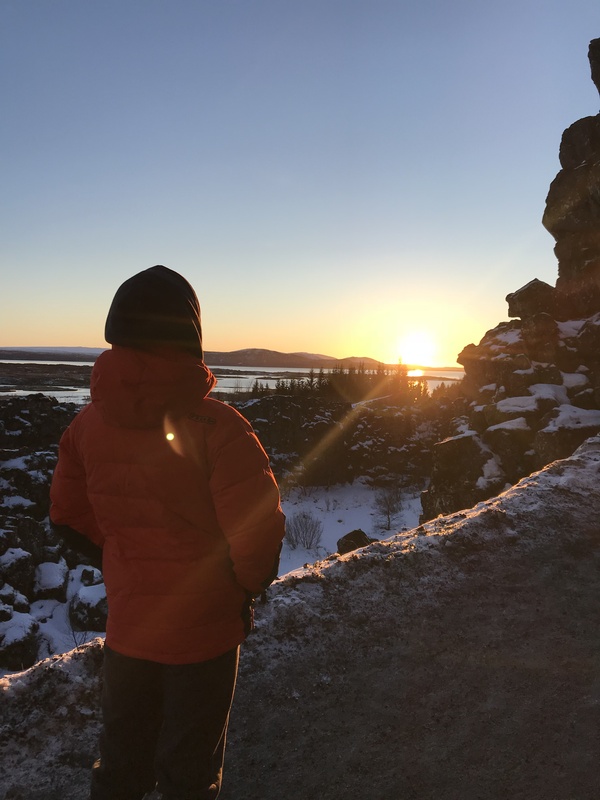 Don’t be fooled by the sun here… the temperature was a balmy -7 degrees celsius. 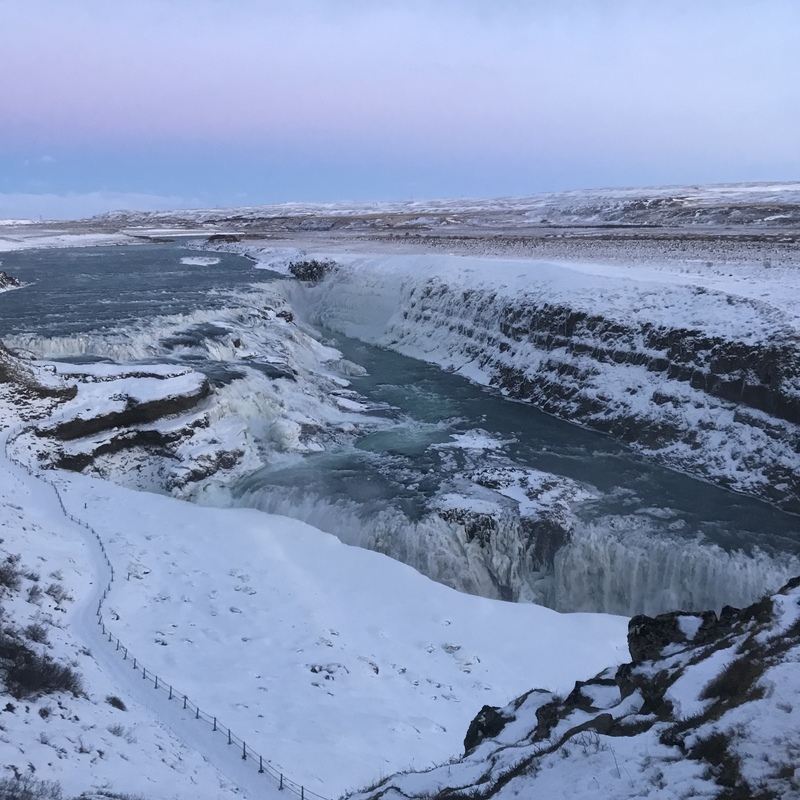 Our next stop was Gullfoss Waterfall, which is considered one of the most impressive waterfalls in Iceland. 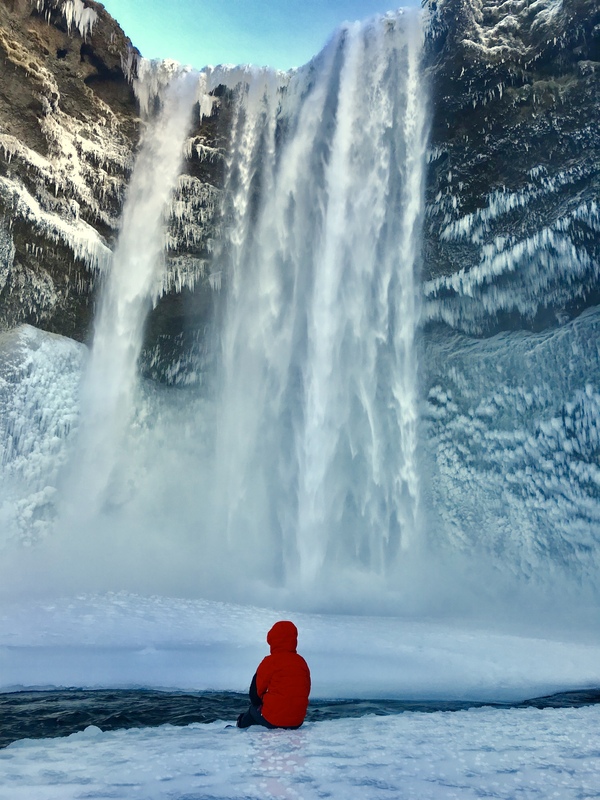 It was a truly awesome sight, and despite the -7 degrees Celsius and biting winds, we were able to really enjoy the stunning views from the two platforms available. 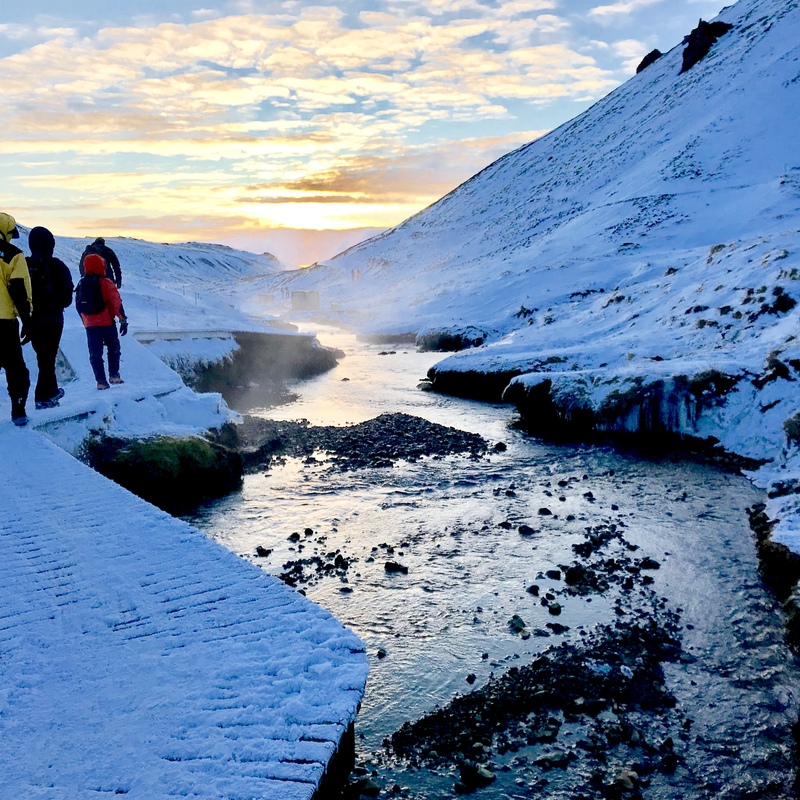 Later that day, we headed to our remote guest house in the middle of Iceland where we’d be spending the next two nights. 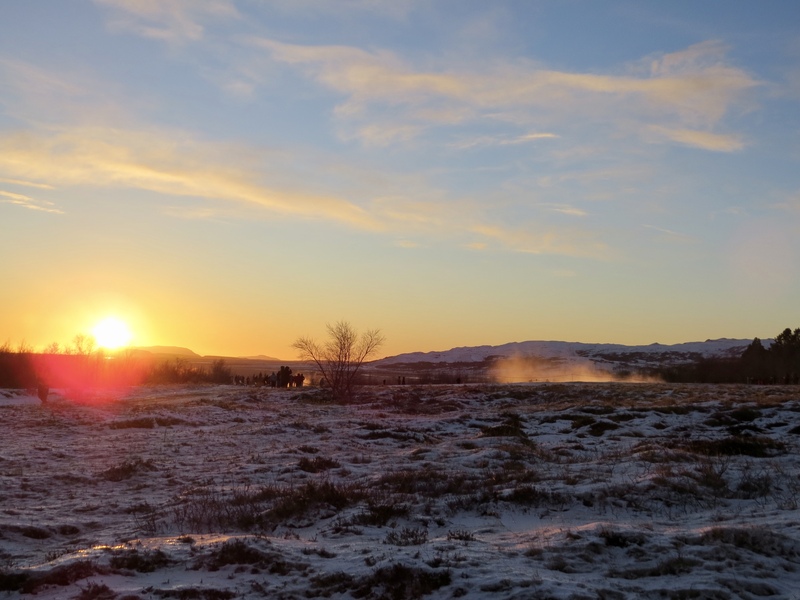 This was our ‘base camp’ to hopefully view the Northern Lights. 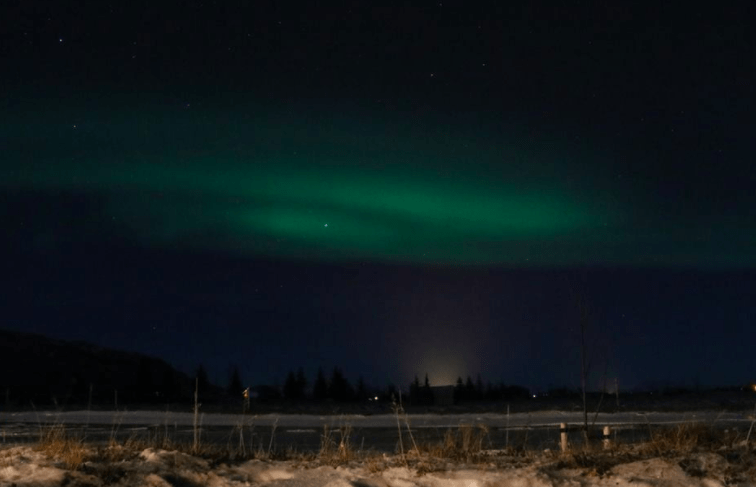 We learned the lights appear only in frigid cold Arctic regions from October to March, and are most likely to be visible in places with the least light pollution. Driving in complete darkness for about 5 miles after we turned off the main road, I figured we pretty much had that covered. We were in the middle of nowhere, there was nothing or nobody for miles around, and we were in the frigid cold. 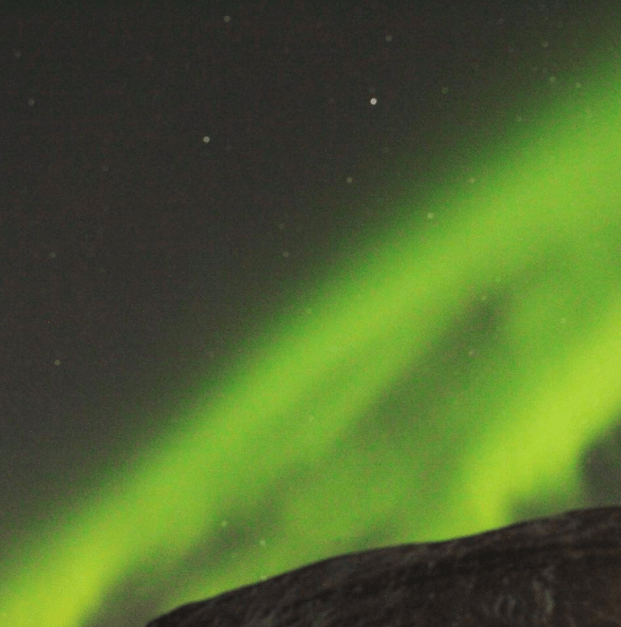 Optimal conditions to view the Northern Lights – Check, Check and Check! 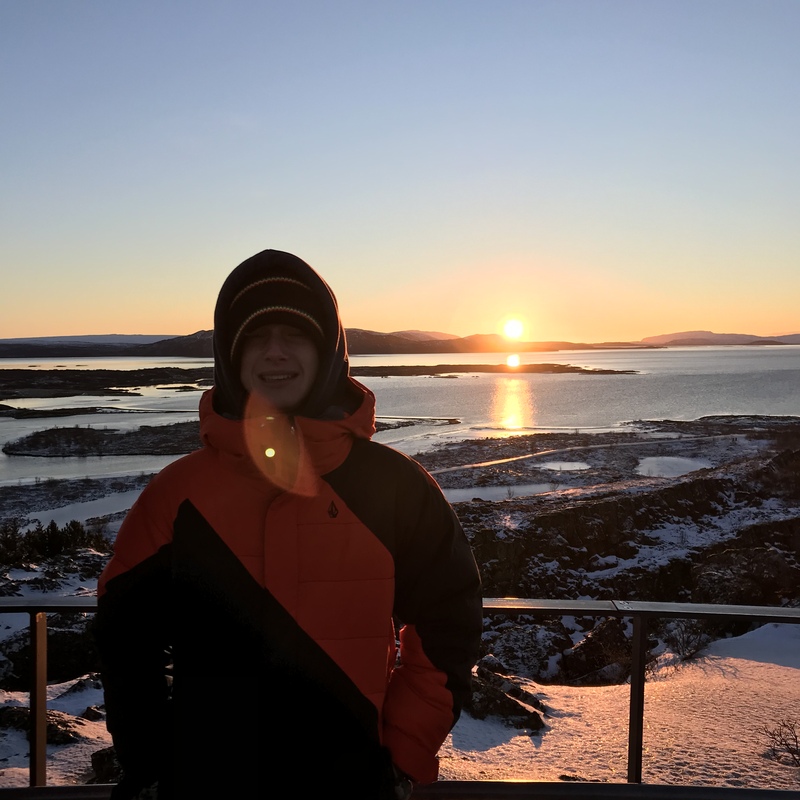 We ate a delicious dinner of fish stew, rye bread and salad, and waited to see if we’d be lucky enough to see one of the seven natural wonders of the world! There’s actually an app to download and track the activity, which sure beats sitting out in the cold all night. We didn’t have to wait long. We were alerted the lights were becoming active and rushed outside with our cameras, whilst pulling on warm clothes. You see you have no idea how long the lights will be out. It could be 2 minutes or all night. We stood outside and watched in awe as this dancing, dazzling display of beauty filled the sky. The lights swirled, the colors changed, and we enjoyed the moment. 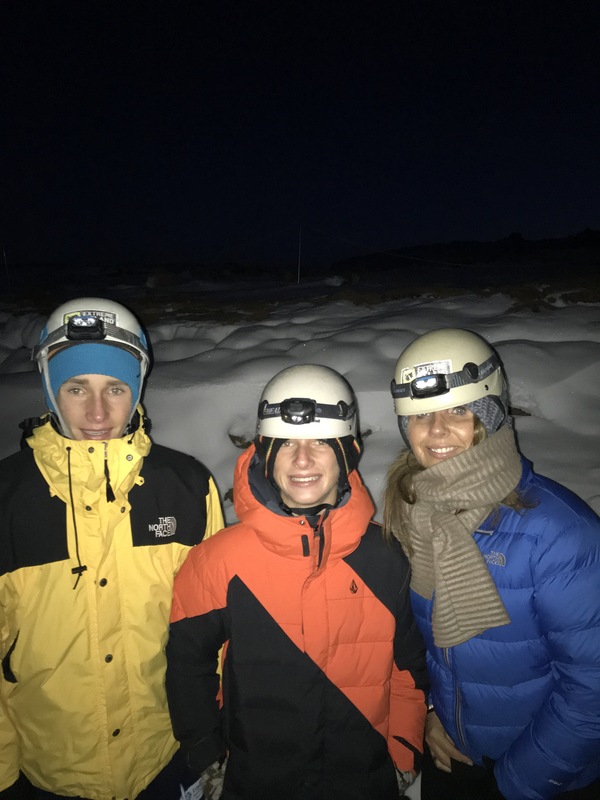 Witnessing the Aurora Borealis (the other name for the Northern Lights) is on every traveler’s bucket list, and we were thrilled to be sharing this moment as a family. Amazing. 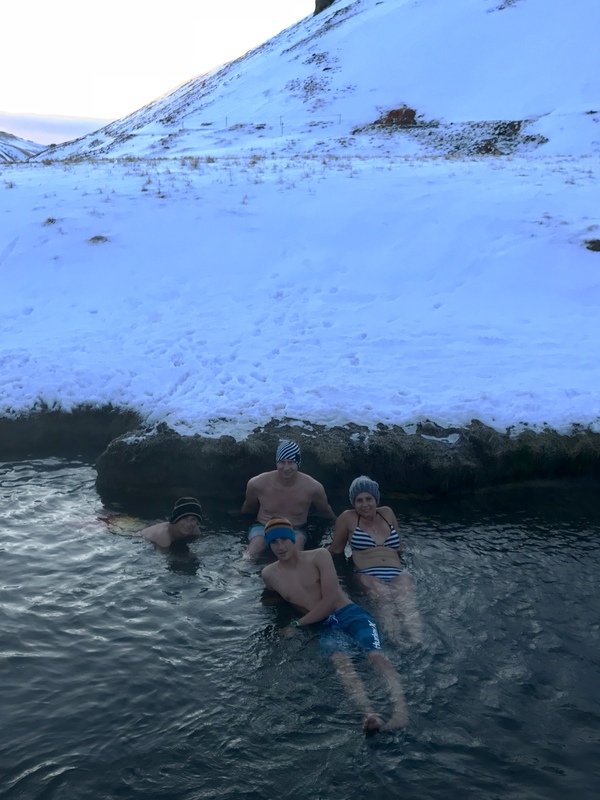 The next day was a hot springs hike to a geothermal river. 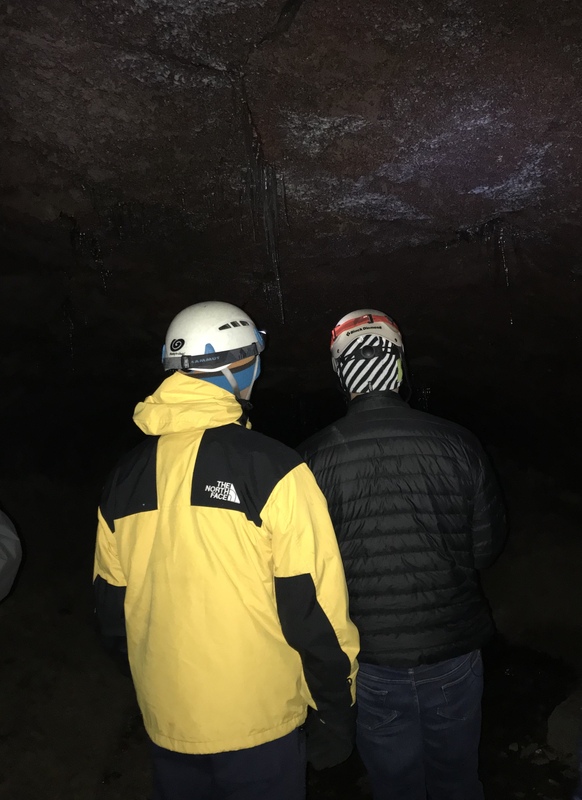 It all looked so benign and fun listed in the tour details, however, I’m pretty sure had I have known what was about to occur, I might have aborted. 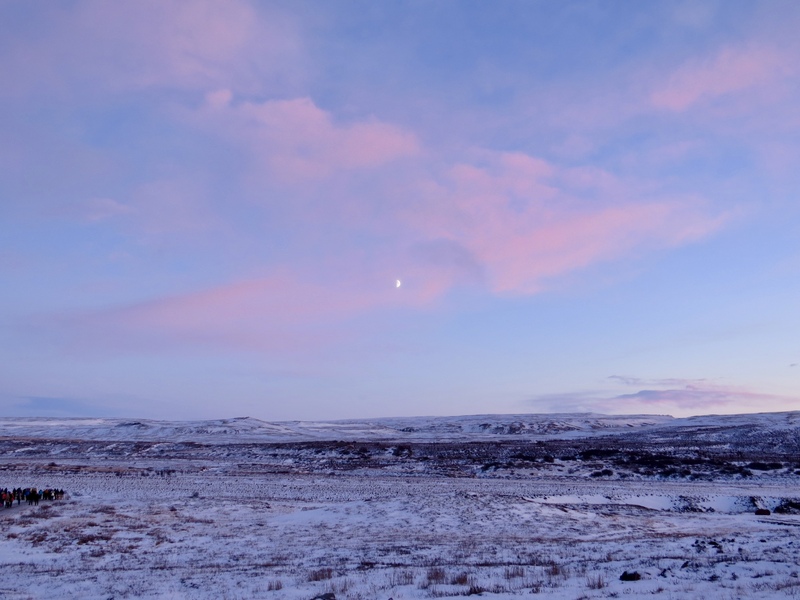 We wrapped up in darkness again, left the guesthouse, and headed to the Reykjadalur Valley area. 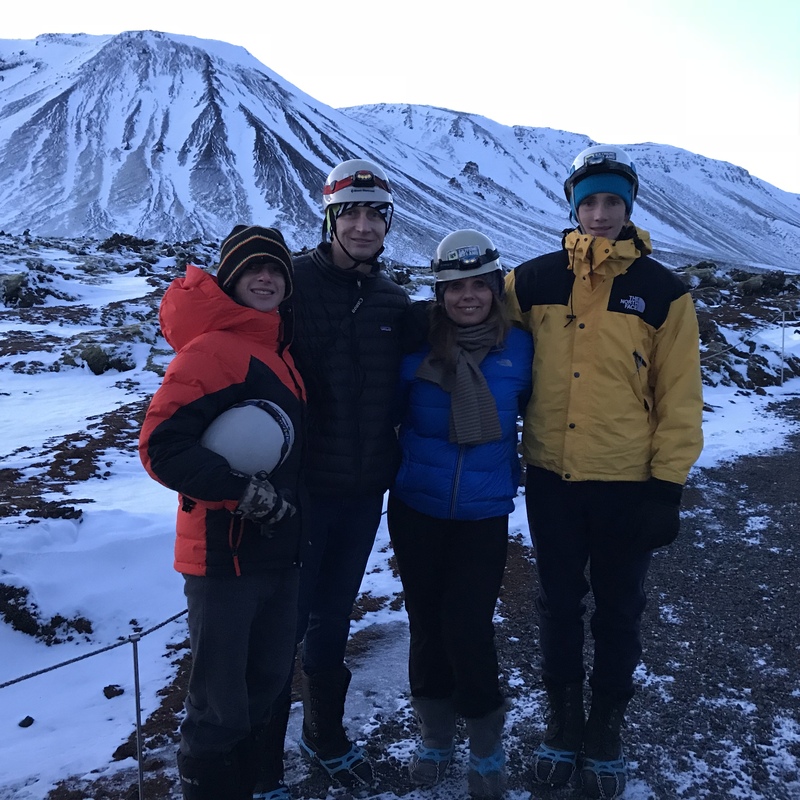 We parked, put on crampons, and faced the mountain range. 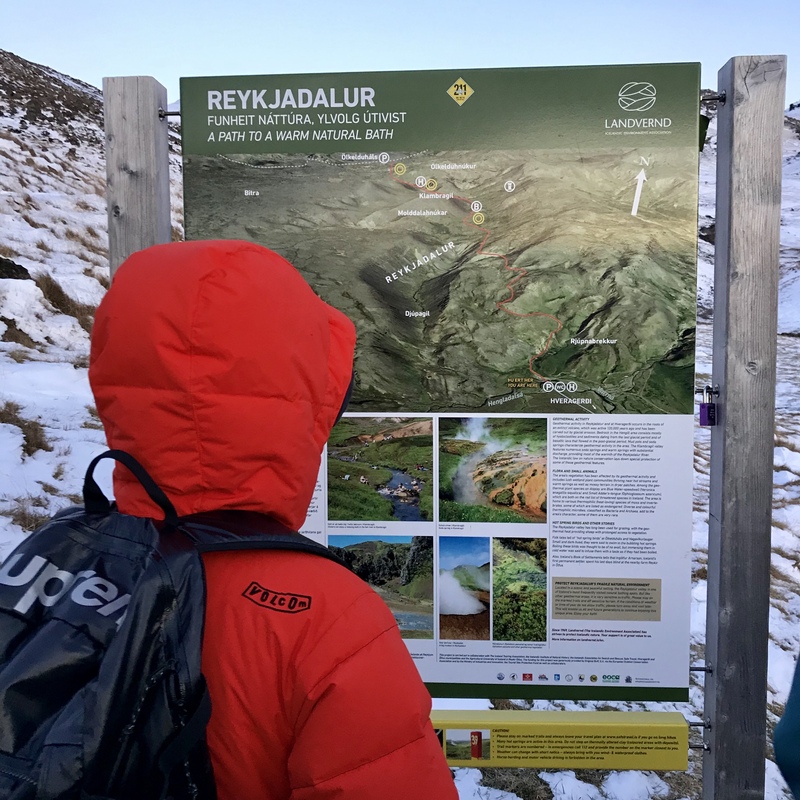 We were at the bottom of the map next to the ‘P’ sign, and hiked all the way to the ‘P’ sign at the top of the map! We were about to hike up the mountain about 4 miles each way to soak in geothermal hot springs. Sounds lovely right? We have never witnessed such beautiful scenery. It was stunning in every direction. 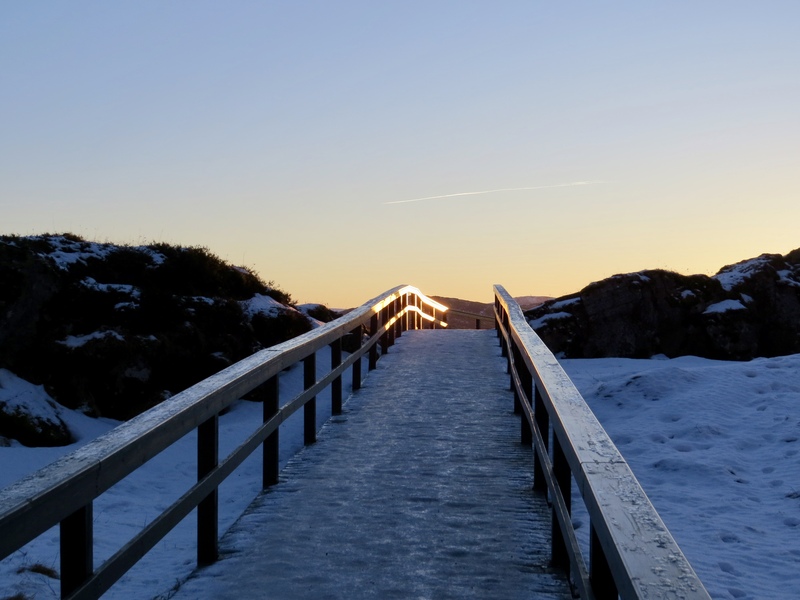 The path was very narrow, and a sheer sheet of vertical ice in some parts. It was -9 degrees celsius and was extremely windy. 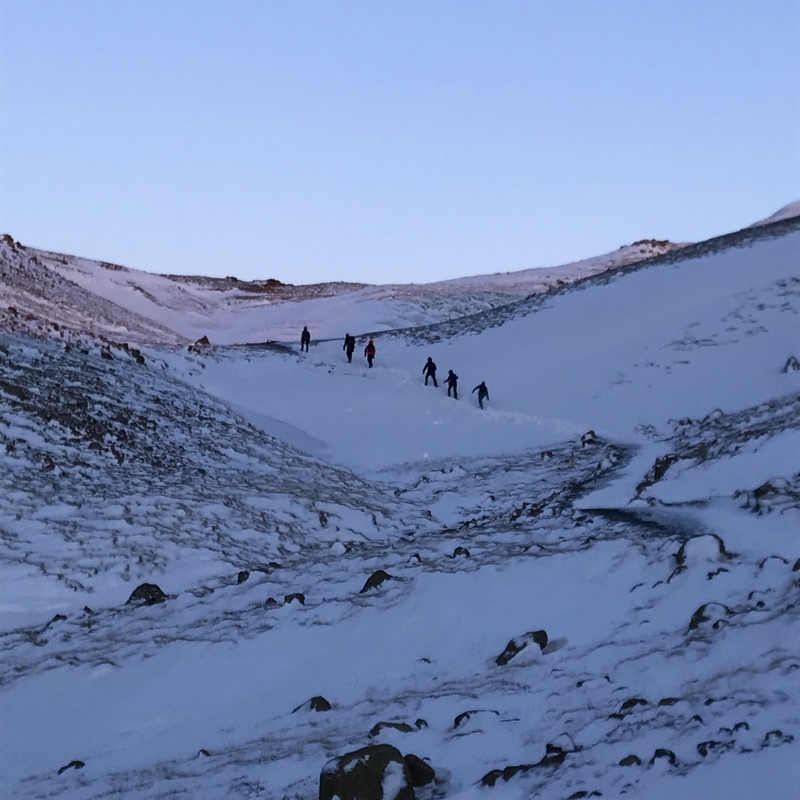 We started up the mountain, and were quickly faced with sheets of ice. 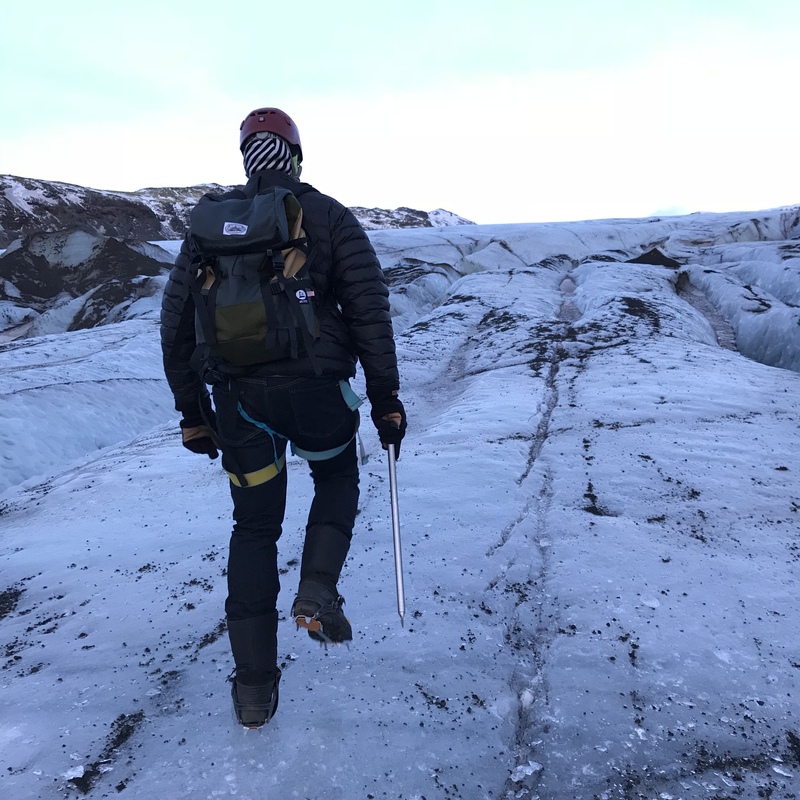 We dug deep (literally with our crampons and figuratively with our minds), put our head down into the wind, and continued uphill. We were greeted with various geothermal pools along the way. We knew we were approaching them by the strong sulphur odor. 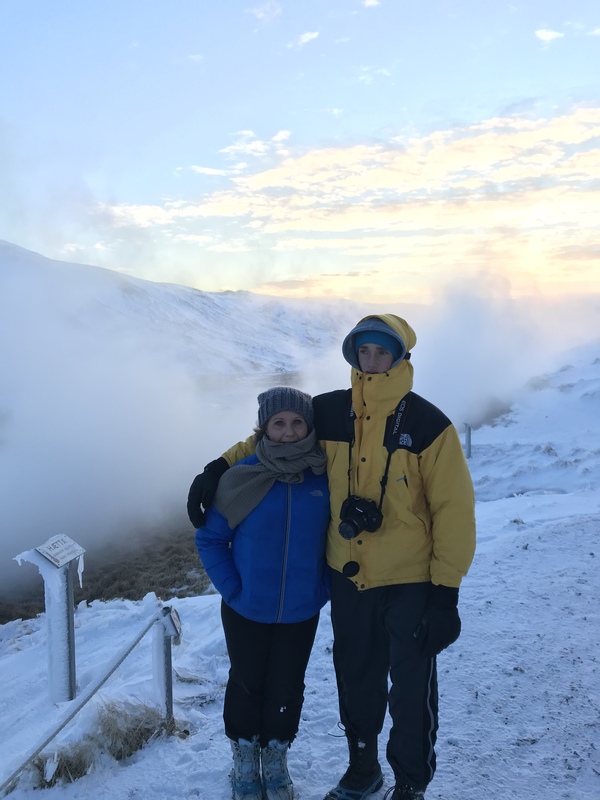 It was a beautiful and incredible hike, and when we reached the geothermal river at the top, that’s where it got a little tricky. There were no changing rooms or hooks for clothes. There was basically a frozen wooden bench and a 5 foot wooden fence/wall thingy behind to brace the wind. 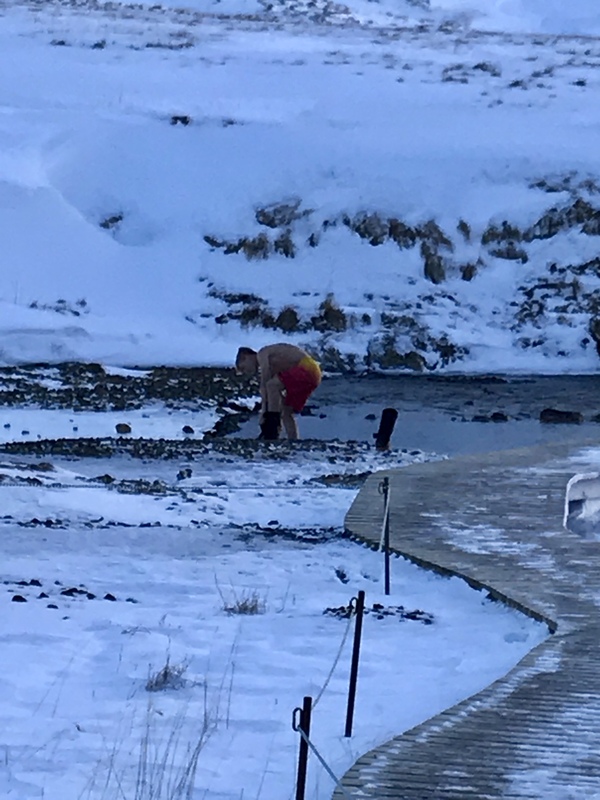 We had to slowly shimmy out of our layers and layers of clothes, and strip down to our bathing suits (we were wearing them underneath our clothes). We needed to wear beanies to prevent our ears from getting frostbite. 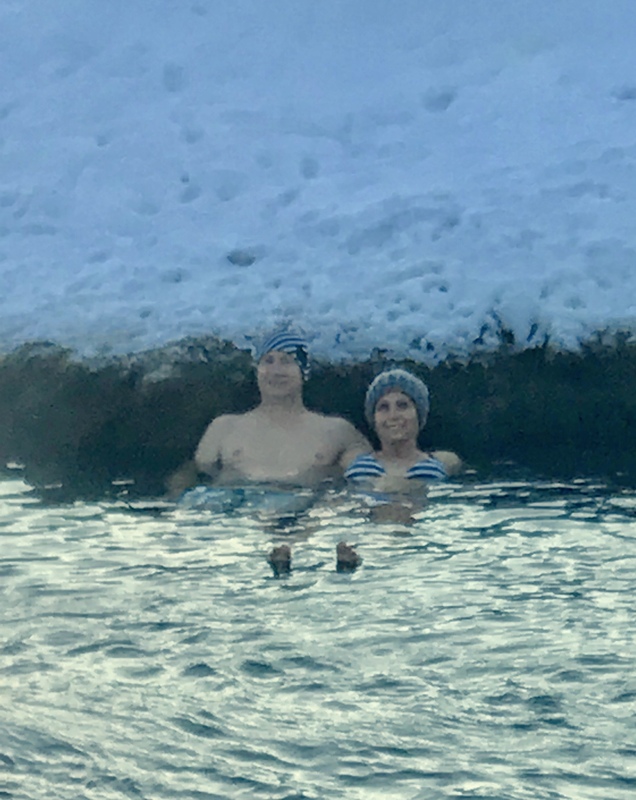 The water was lovely and warm, just like an outdoor hot tub, and once we had successfully navigated the ice stairs without losing front teeth, it felt amazing. We lay back, relaxed, soaked in our surroundings, and enjoyed the moment. We were in heaven, and for 45 minutes it was so incredibly peaceful. However all too quickly, the heat became unbearable, and we were all pretty much baked, so we faced the trickiest part; getting out, dressed, and back down the mountain. We decided to get out one at a time so we could help each other. Hot Hubby and I first, then we’d help the boys get dressed. 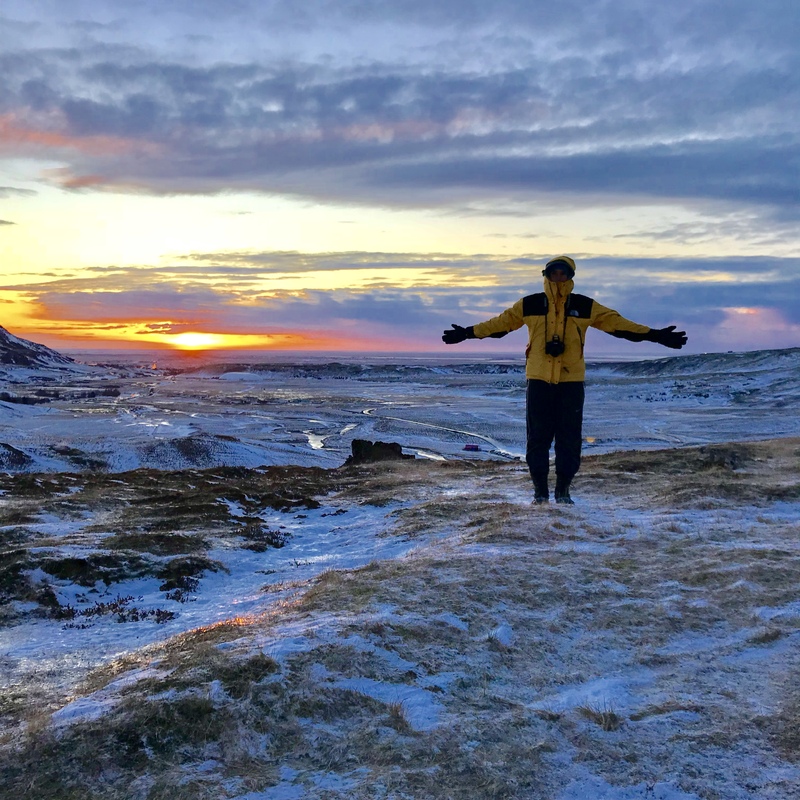 It was freezing cold, the wind was howling, my hair was frozen and I couldn’t feel my ears. It was tricky to get clothes over our damp bodies and many swear words were uttered. By us all. I’ve never been so freaking cold! We helped the boys and began the long hike down the mountain. 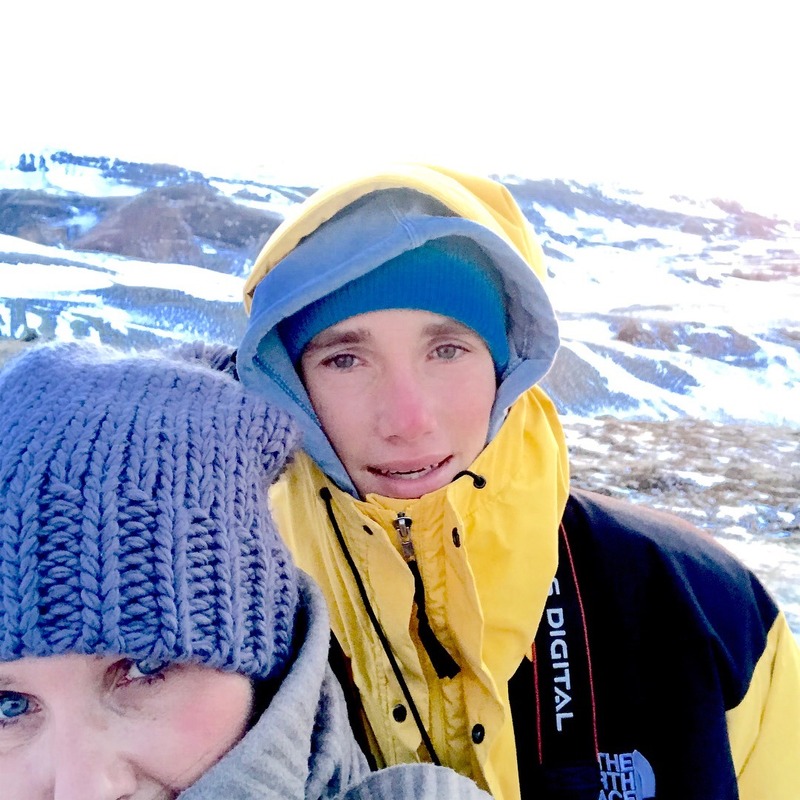 Our bodies slightly warmed with the strenuous hike, however our fingers and toes were frozen to the bone…. Julian said “mom, this just isn’t fun right now.. I’m sorry.. but it’s not”, and I agreed with him. 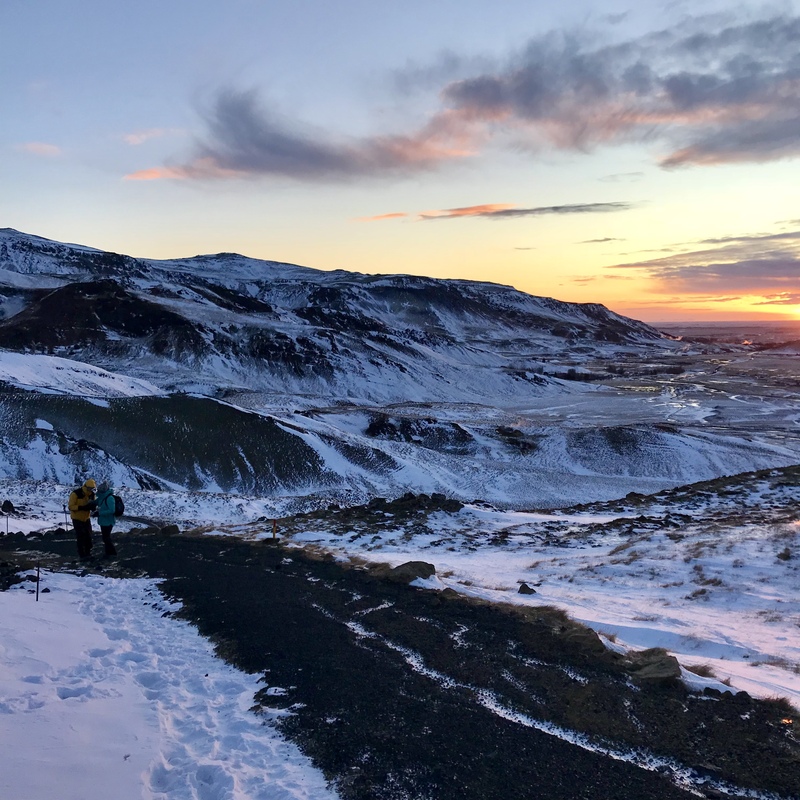 We hiked as quickly as possible down sheets of ice, clinging to the edges of the cliff by our toes at times, and tried to reach the bus before dark (which happened around 3pm!) We drove back to our guesthouse in frozen silence, dreaming of hot showers. 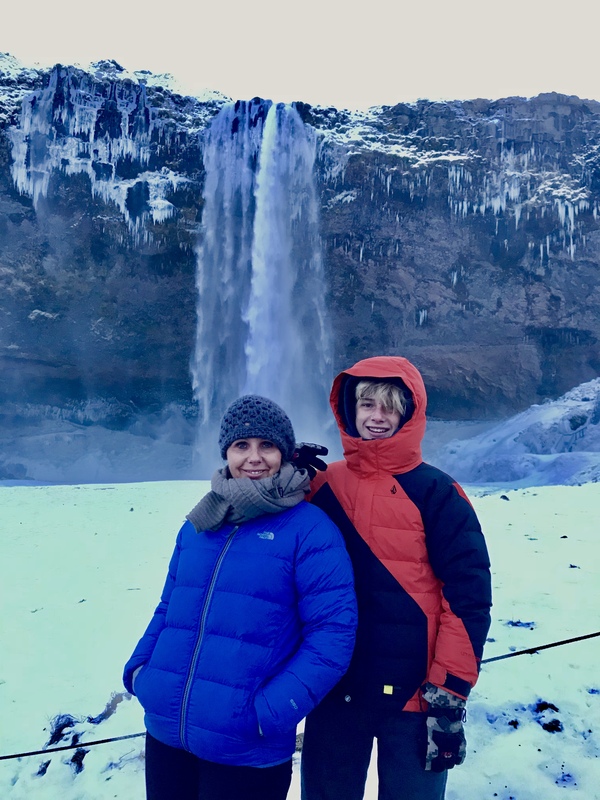 It’s funny, as soon as we were warm, showered, in cozy clothes, and (some of us) drinking vodka, the day didn’t seem quite as brutal. 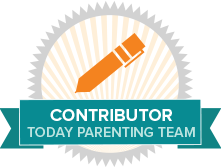 In fact, it was one of our most amazing experiences ever as a family. It was hard, challenging, and beautifully amazing all at the same time. We were happy we faced our fears (some of us were more fearful than the others) and actually had the strength to do this. 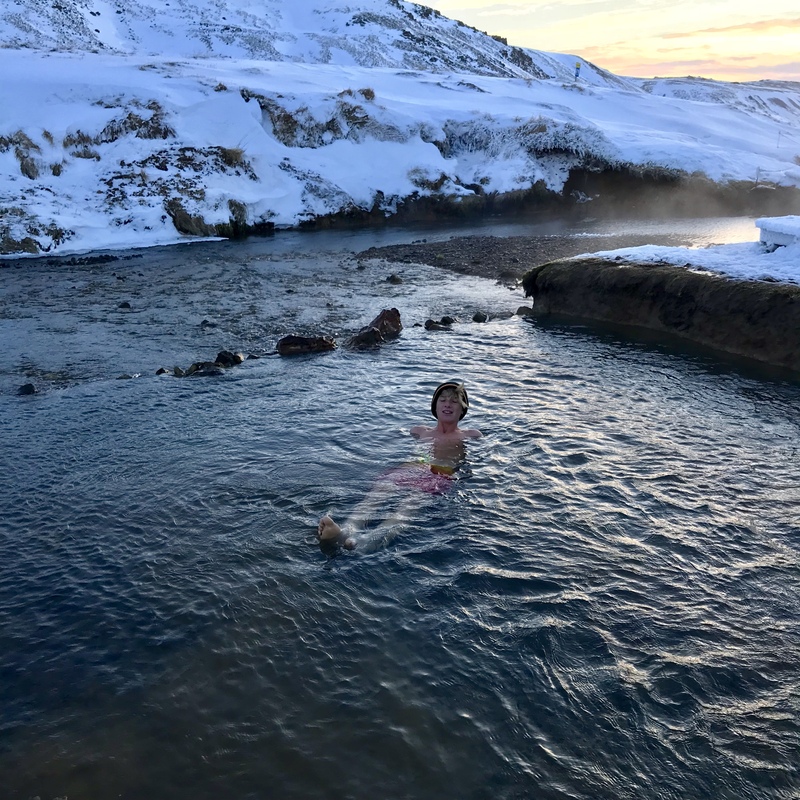 I mean, when else would we hike to a geothermal river, hop in for a bath, then hike back down! So cool. 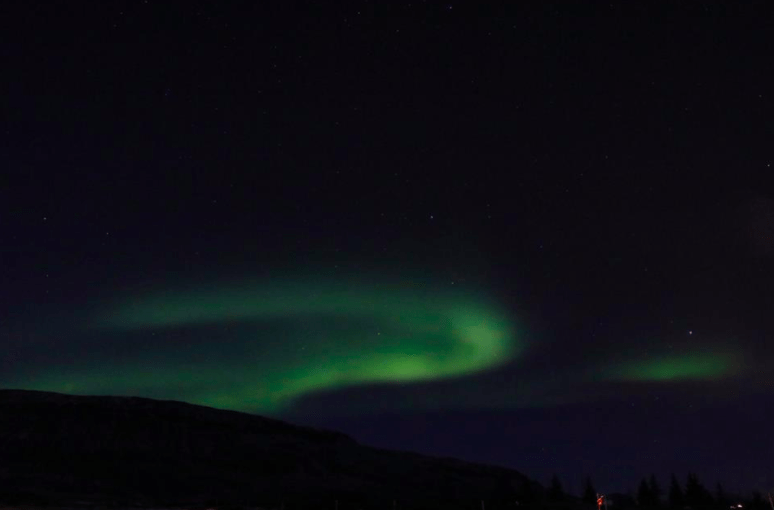 We were again so fortunate and were treated to a beautiful encore of the Northern Lights on our second night. This time they were swirling across the sky and we saw streaks of pink along with neon greens. Amazing. Inspiring. Stunning. 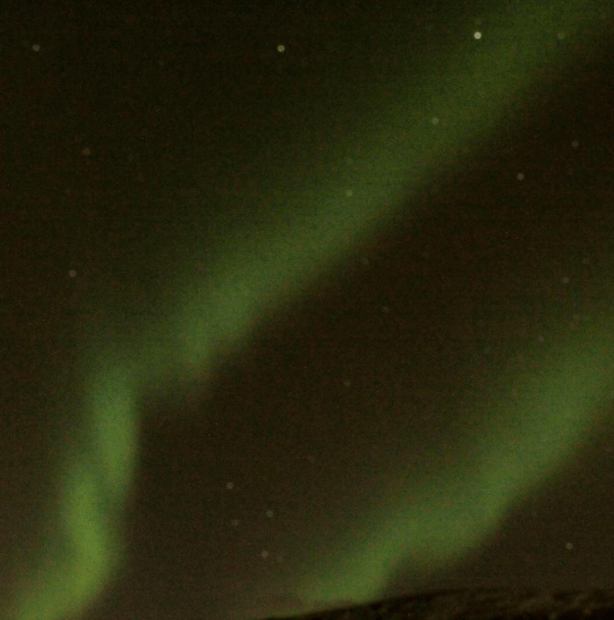 We went to bed feeling extremely grateful and content, having experienced the Northern Lights together. The next morning after a delicious breakfast, we headed out for another action-packed day. 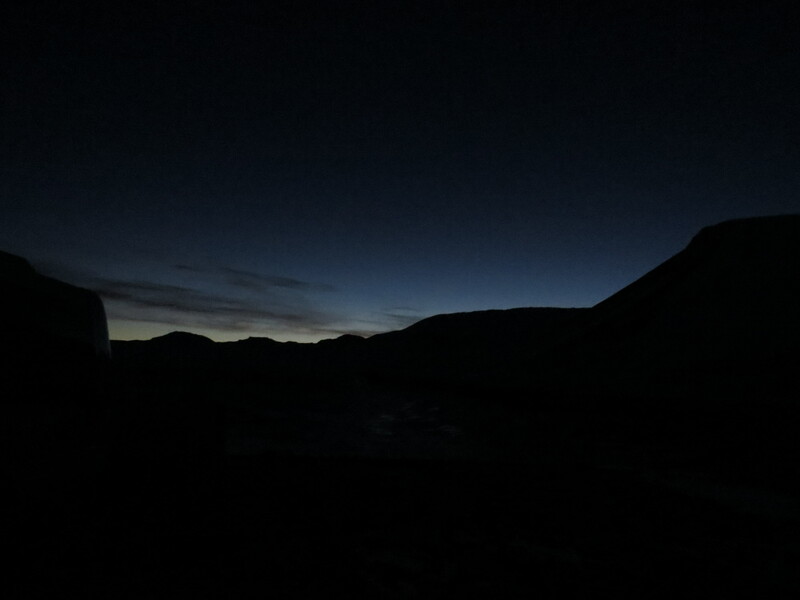 We drove (in darkness obvi) towards the Solheimajokull Glacier. 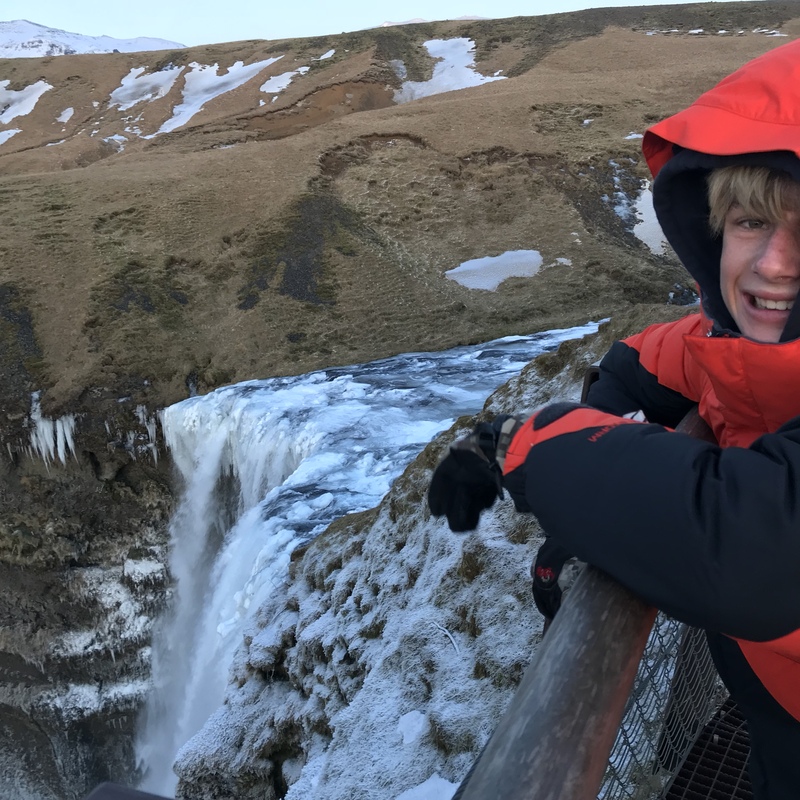 We stopped on the way to see Skogafoss waterfall. The sounds of the water crashing down 200 ft falls was simply stunning. 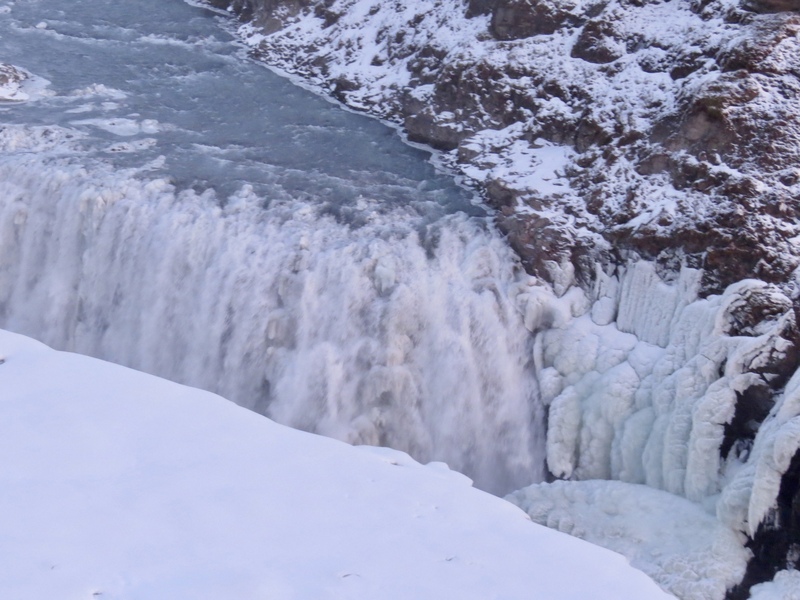 We were able to walk very close to the falls (on a sheet of ice of course), and up a steep staircase to view the falls from the top of the cliff. 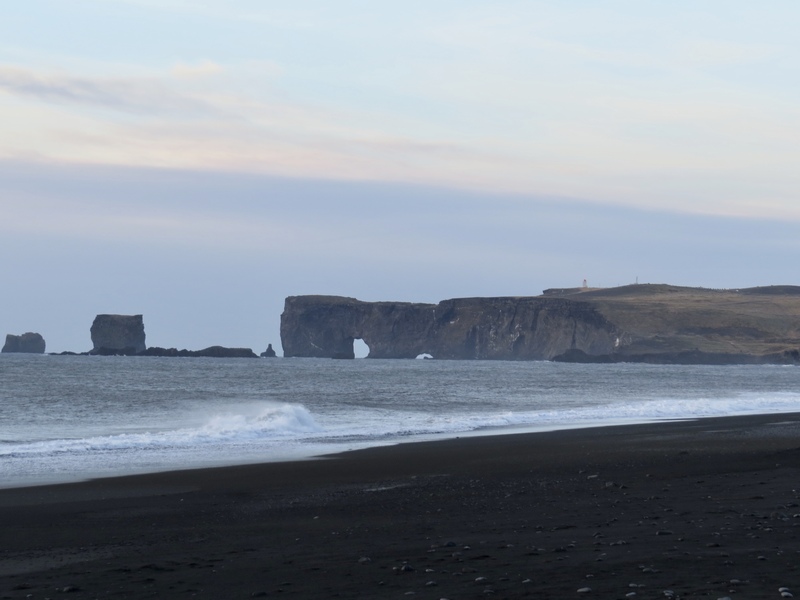 We also visited the black sand beaches located on the Southern part of the island next to the town of Vik. 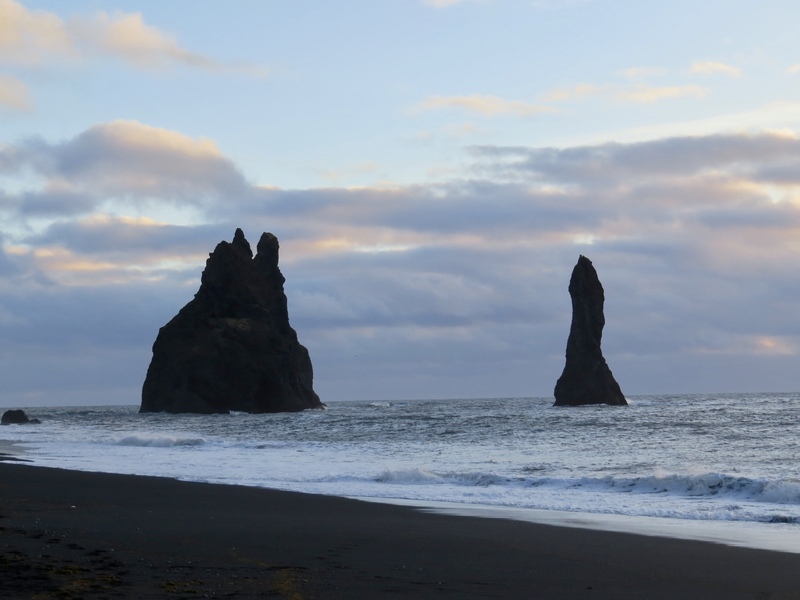 The beach is full of small pebbles that are a deep black color made of lava. 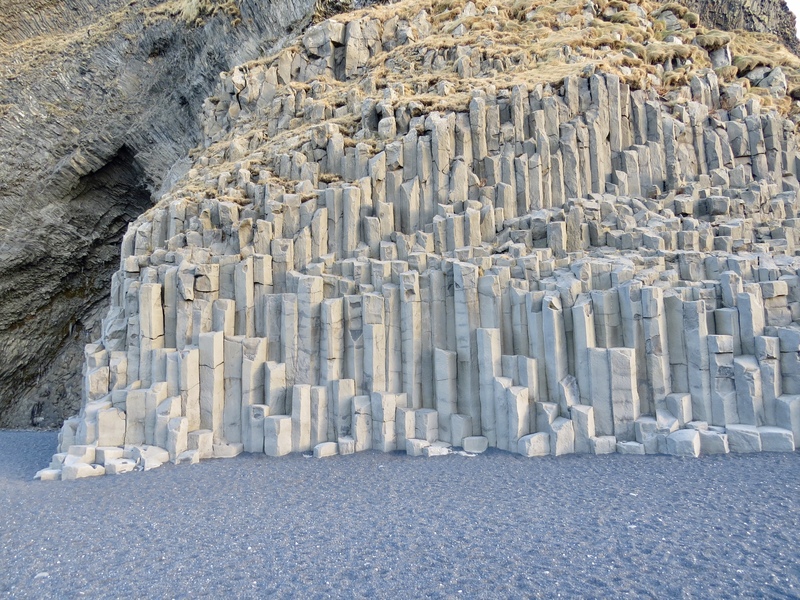 Facing the sea is a huge natural pyramid made of perfectly shaped basalt rock columns and the basalt cliff is called Gardar. 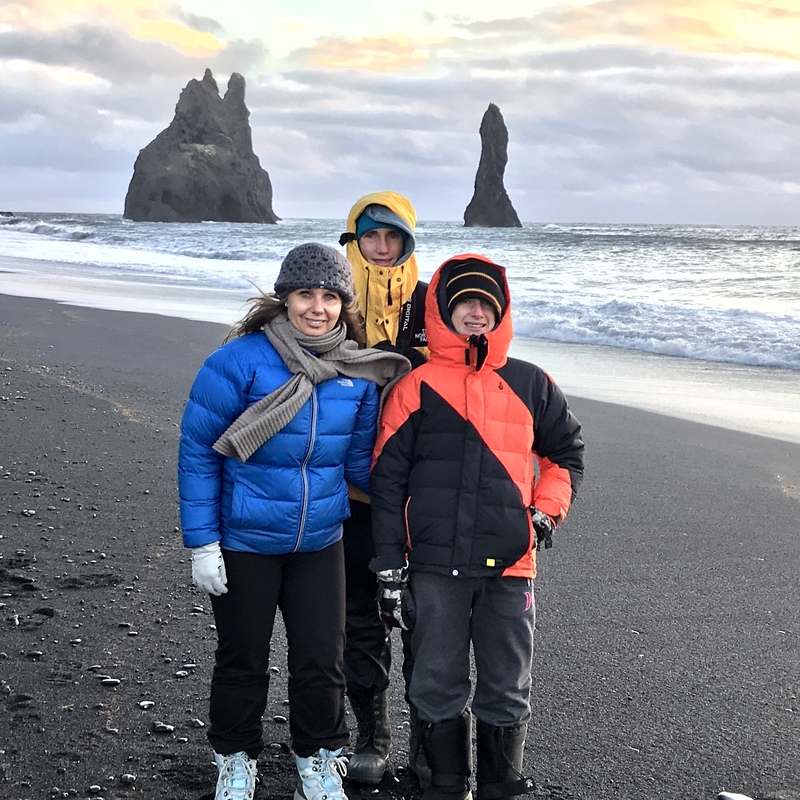 In the sea facing the cliffs stand two dramatic looking sea stacks called Reynisdrangar. 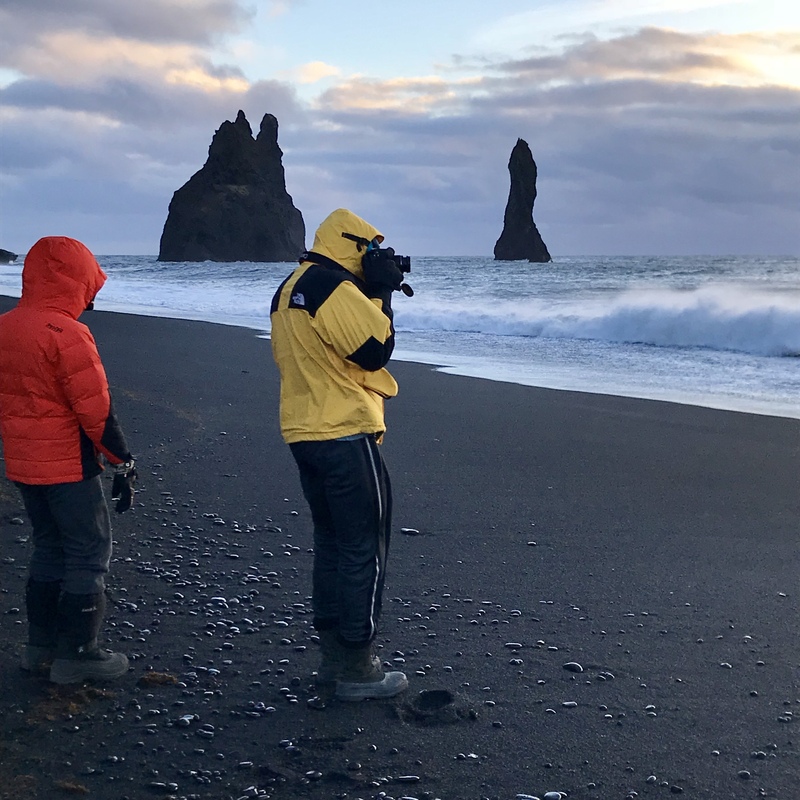 Legend has it the Reynisdrangar formations are actually two trolls who were stuck out at sea when the sun began to rise, and consequently, they turned to stone. 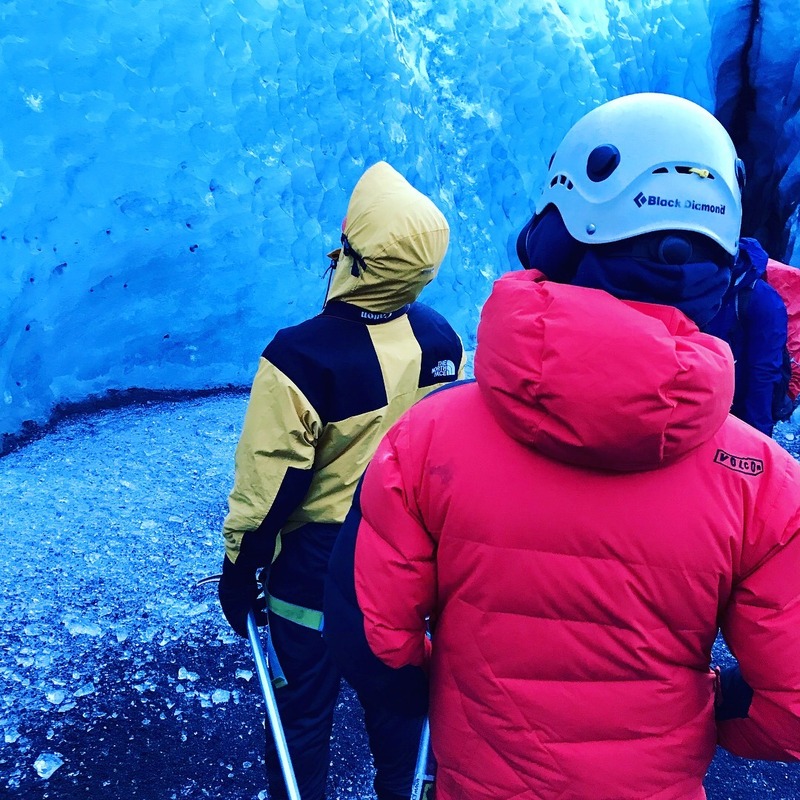 It was now 1pm, and we headed towards our glacier hike. 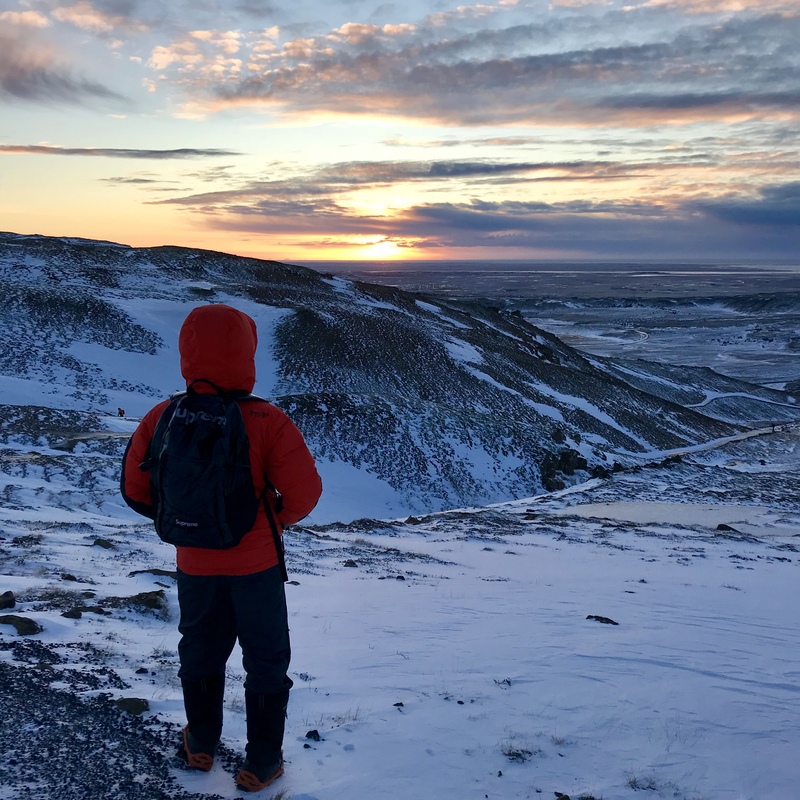 The sun was beginning to set, the windchill had picked up, and we were facing a 4 hour hike on a glacier. 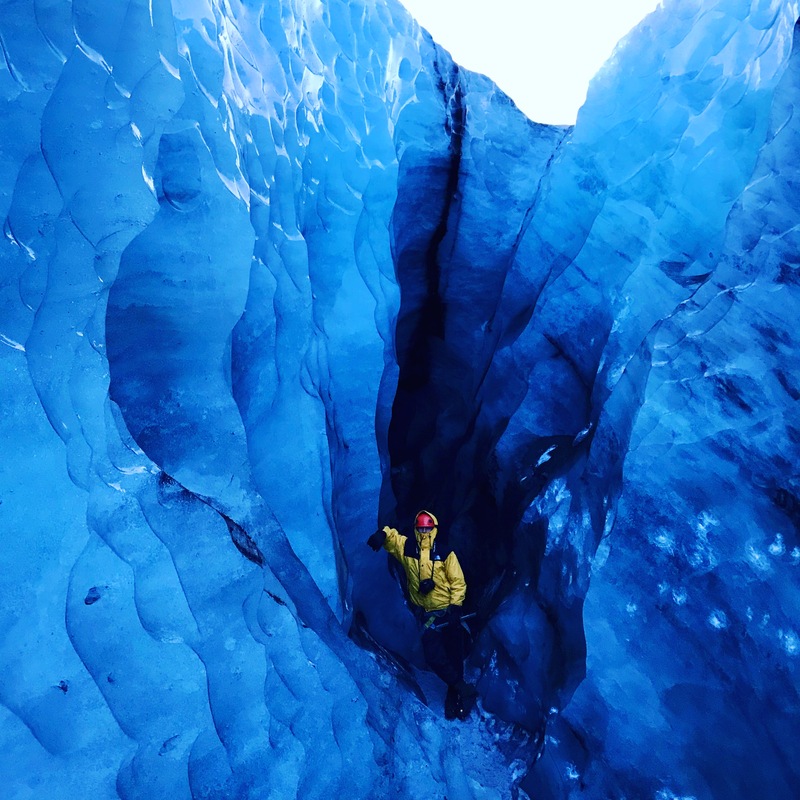 We pulled into a parking lot next to an old school bus at the base of the glacier, and discovered this was where we’d pick up our gear and our glacier guide. 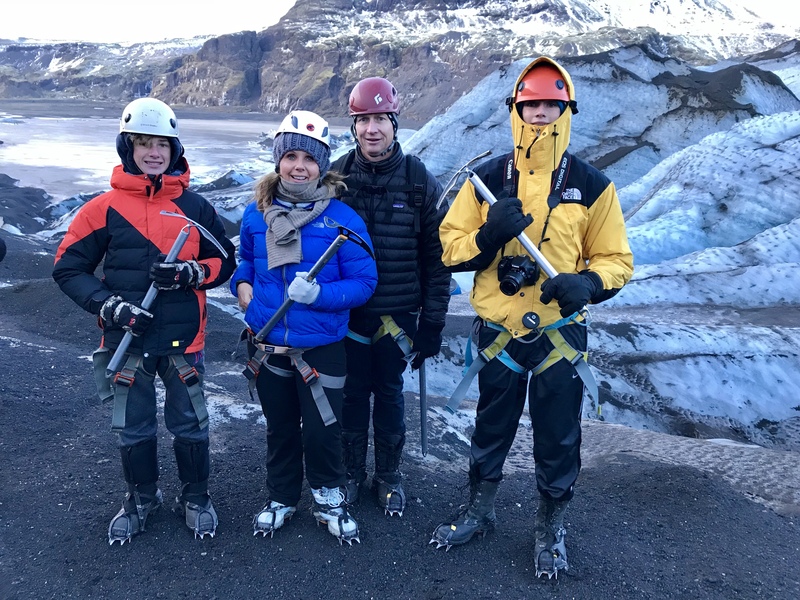 We collected our crampons, helmets and pick axe, and after our safety talk we began to hike through the valley. 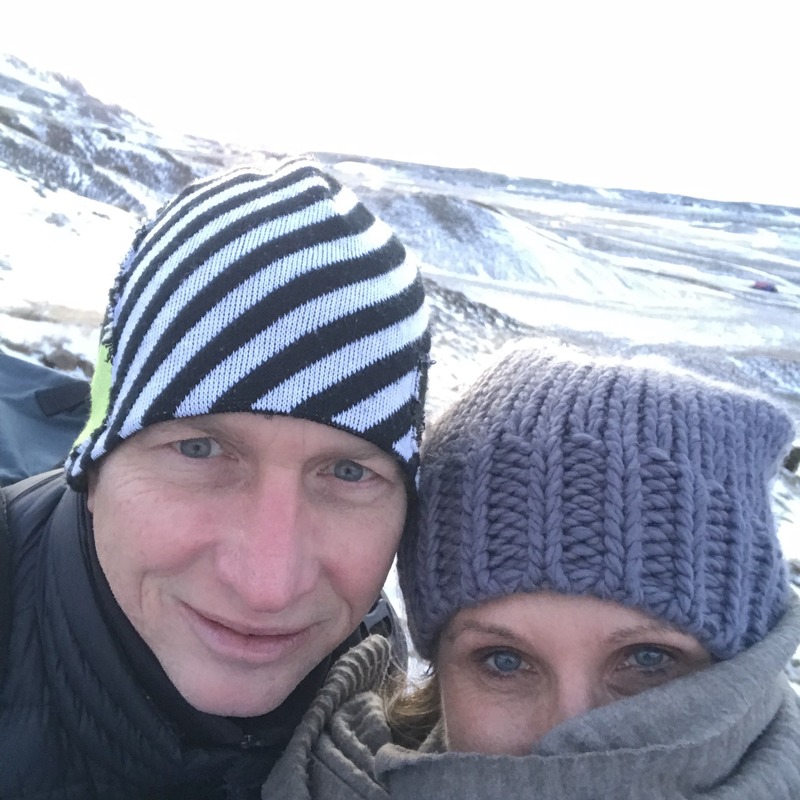 We saw the black covered glaciers and beaches from the 2010 volcanic eruption, and walked to the edge of the ice. 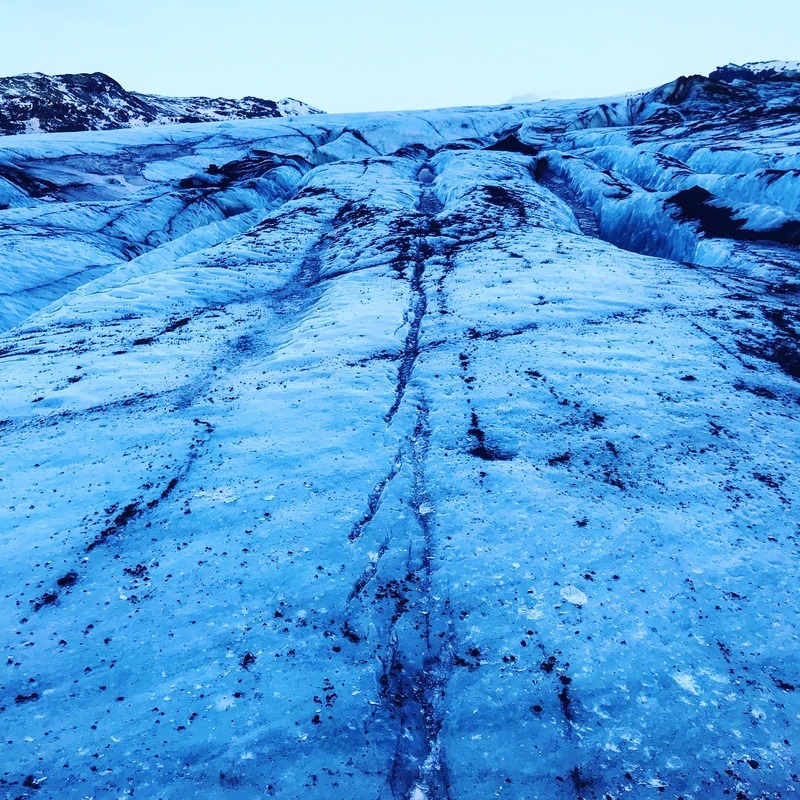 Once we arrived at the glacier base, we began our slow ascent up the glacier. 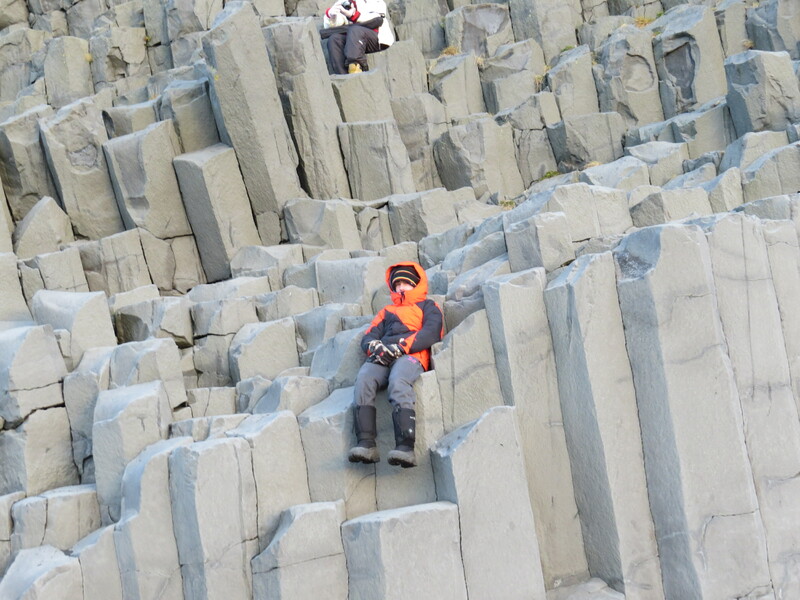 It was very controlled, safe, and freezing cold. 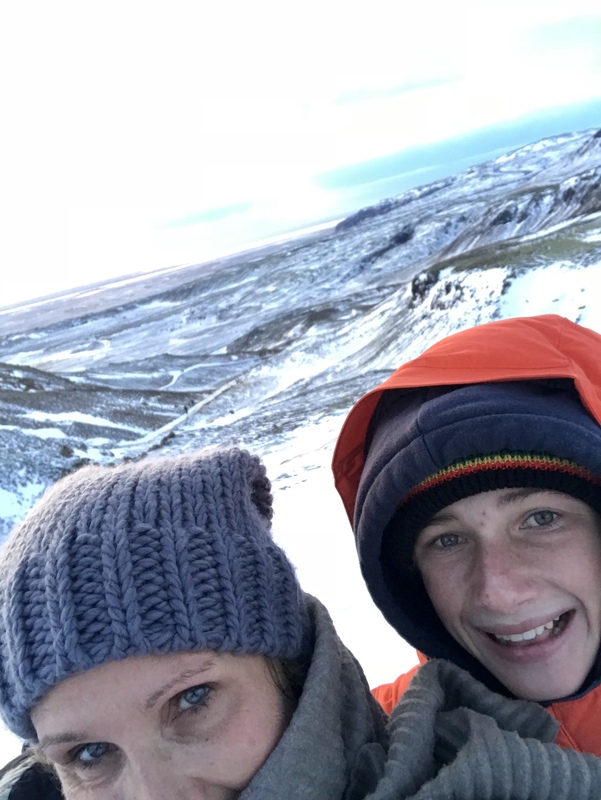 We could see for miles around the stunning views of surrounding mountains, glaciers, and the Eyjafjallajokull volcano. 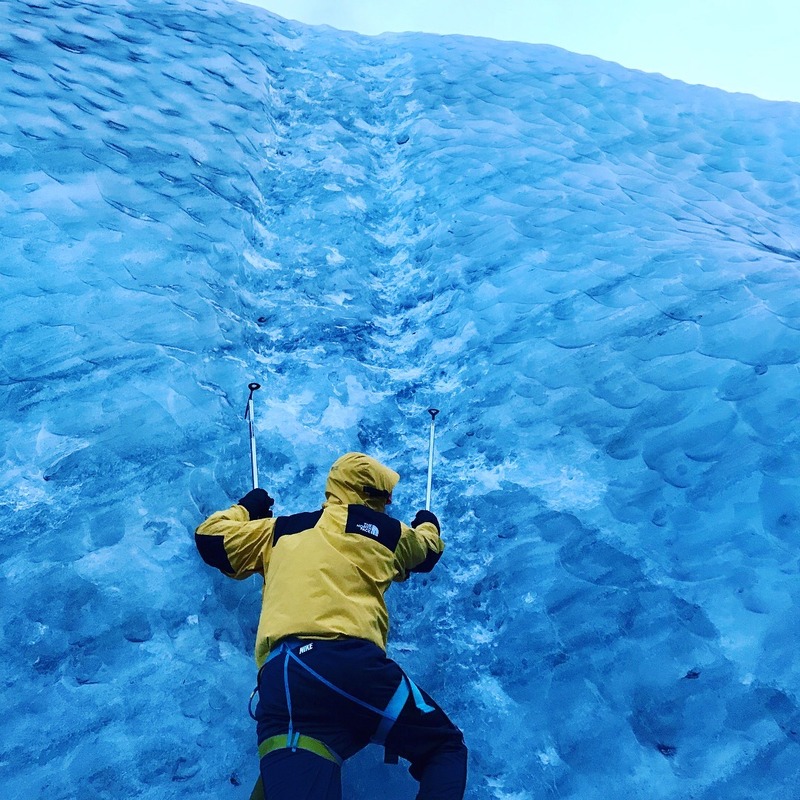 We reached an ice wall, and our guide showed us how to climb the wall using pick axes, and shared his extensive knowledge about the glaciers and how they formed. 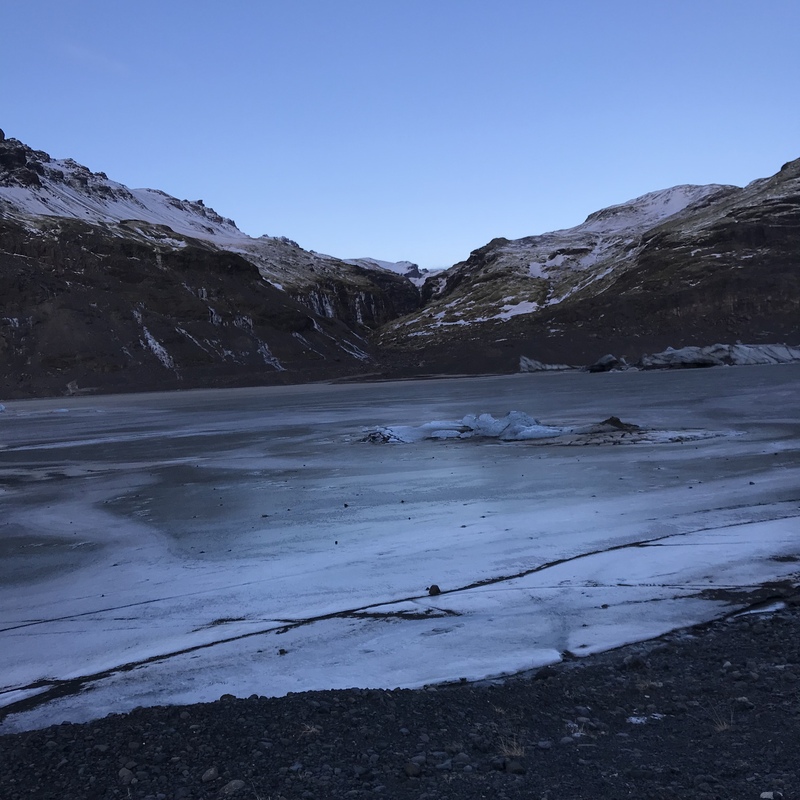 Since it was pretty dark at this point (4pm), we turned around, headed back down the glacier, treading carefully down the ice steps we just climbed, trying not to fall. We reached the bottom and the parking lot was in complete darkness. 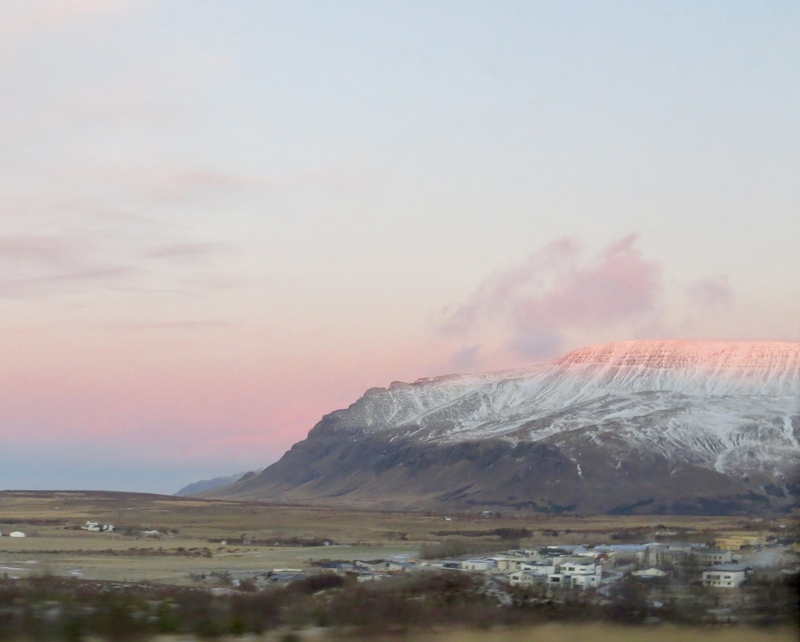 We turned in our gear, cuddled up on the bus, and settled in for the 2 hour drive back to Reykjavik. We were tired, hungry, cold and exhausted from our 5-day adventure. It was incredible to experience this as a family, and we will all treasure these memories forever. 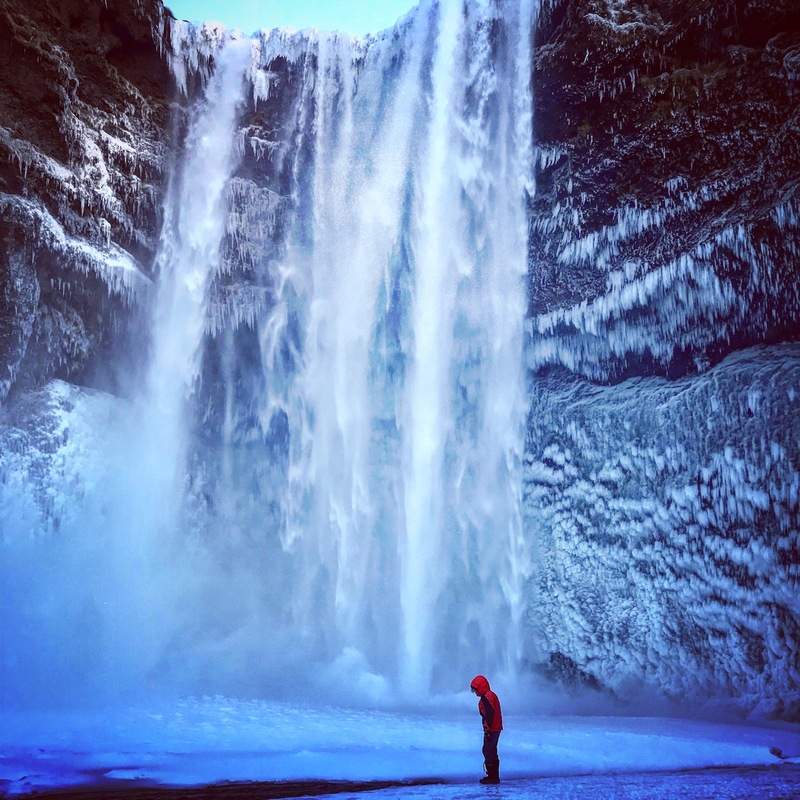 Iceland is having a ‘moment’ right now, and if you’ve been contemplating visiting this glorious country, I wouldn’t hesitate, and would visit sooner rather than later! 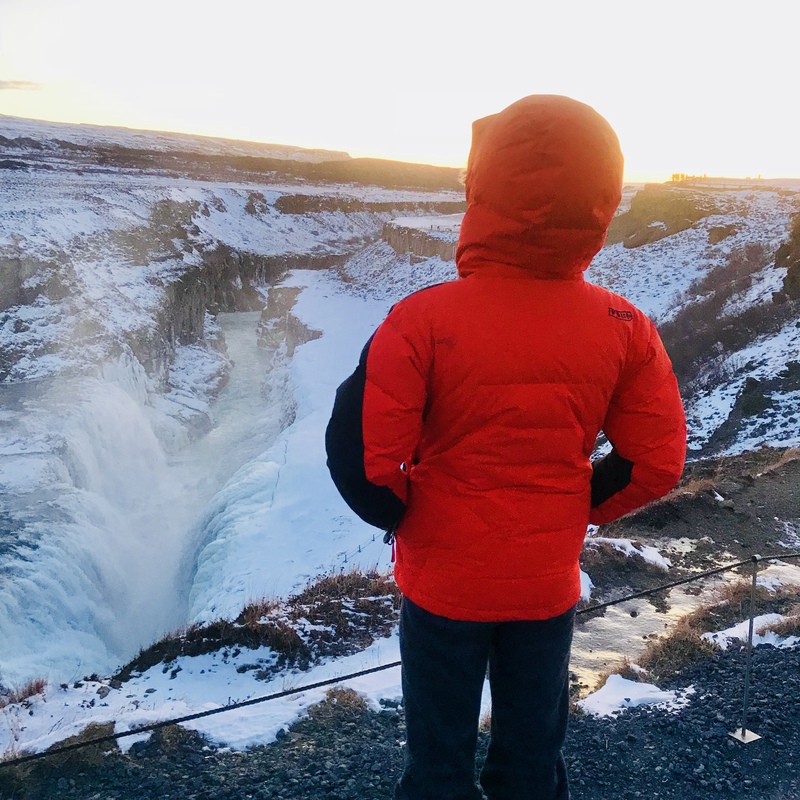 I’ve always wanted to visit Iceland and do the golden circle! This post just might the thing that pushes me to get planning! You should! It was amazing, and one of the most unique places we’ve ever visited! 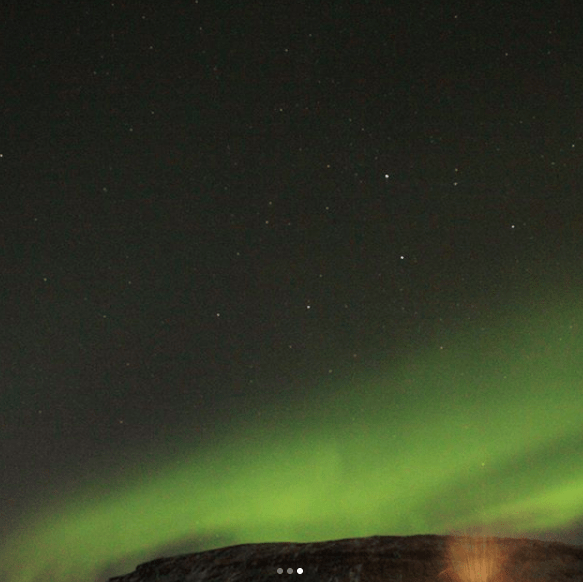 I really want to go to Iceland this summer. I made a picture of the Blue Lagoon my screen saver on my phone to remind myself to not spend too much money. That hot spring looks crazy. I cannot imagine having to put clothing back on in such a drastic change. 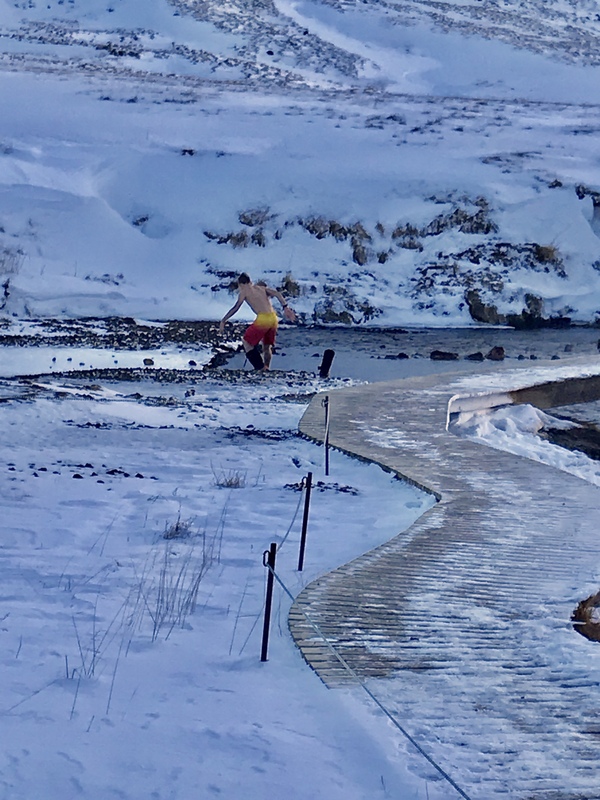 I hope you are able to go in the summer… it’s not a problem putting clothing on after being in the Lagoon as the changing rooms are indoor and there are lovely warm showers in there too. It’s an incredible place and I really hope you get to experience it!